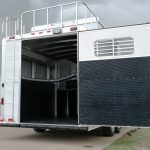 Conventional slant load trailers are one of the prevalent designs in the market today. 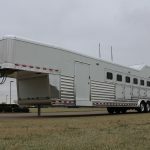 Available in multiple widths, lengths and heights, our standard slant load trailers are designed with two to nine horses in mind. 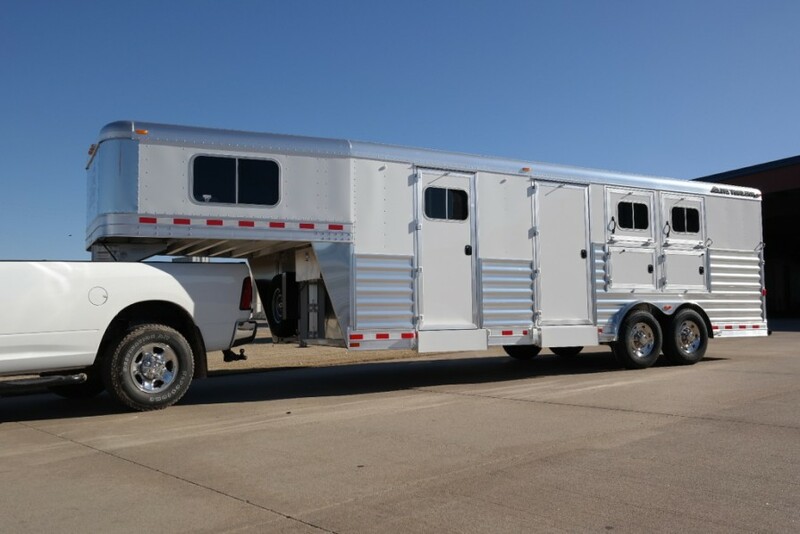 Custom models are available to haul many more. 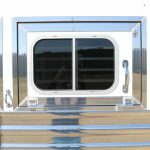 Most of our living quarters trailers will start with our standard slant models, then customized to fit the requests of our customers. 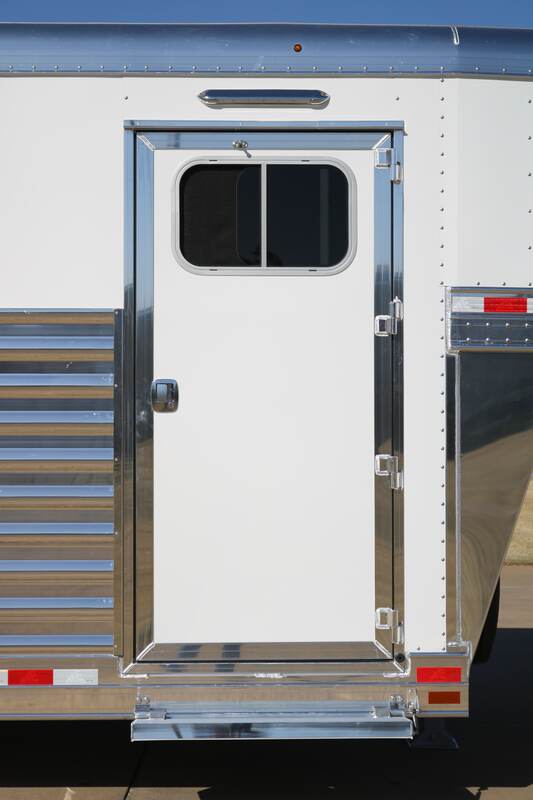 Lower Front of Manger 1-1/2"
7' (Standard), 7' 6", 8', 100" and 102"
DoorsAll Elite built doors are engineered with heavy duty, proprietary extrusions and constructed to allow for maximum seal. 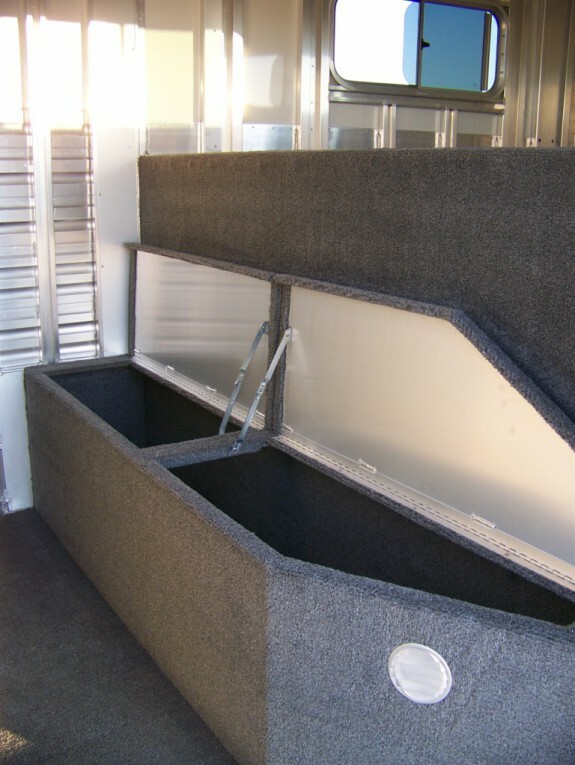 Drop BarsElite built drop down bar mechanism is machined to allow ease of use. 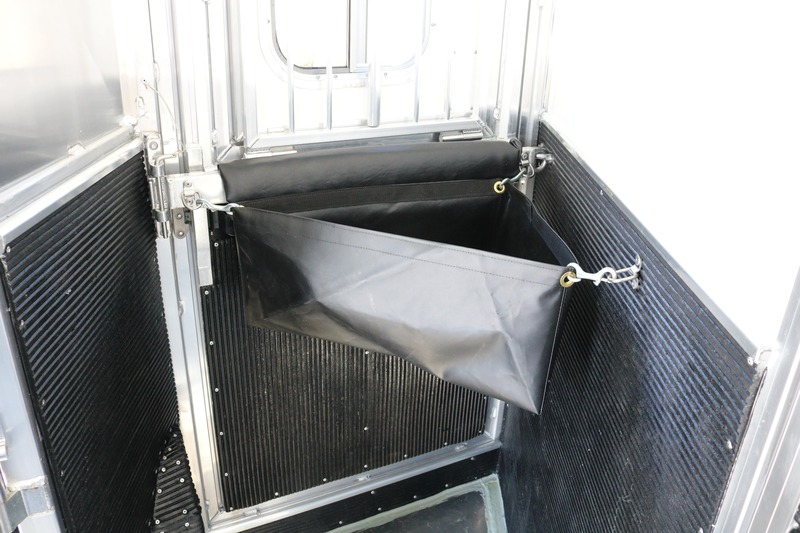 Independent from the drop down door allows for simple use. 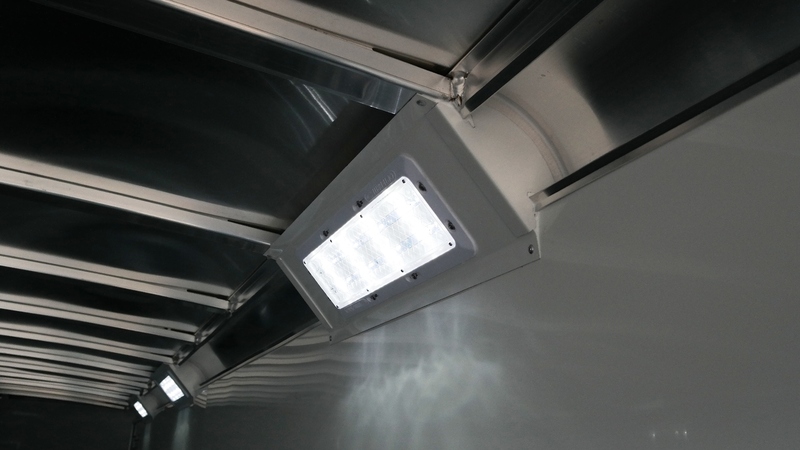 LightingElite utilizes LED interior and exterior clearance lighting in all wiring harnesses. 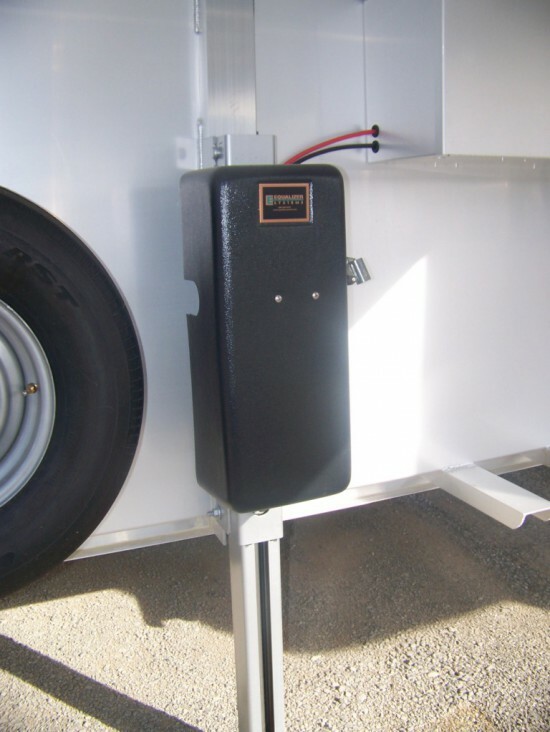 All wiring connections are plugs or are soldered, covered with heat shrink material. 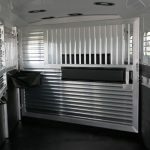 Bulkhead Wall.090" smooth sheet welded on to our heavy duty wall posts. 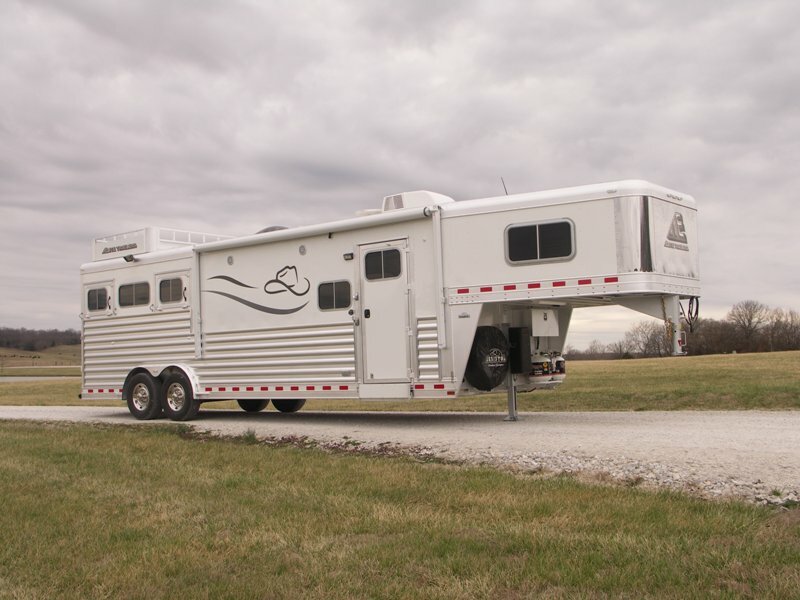 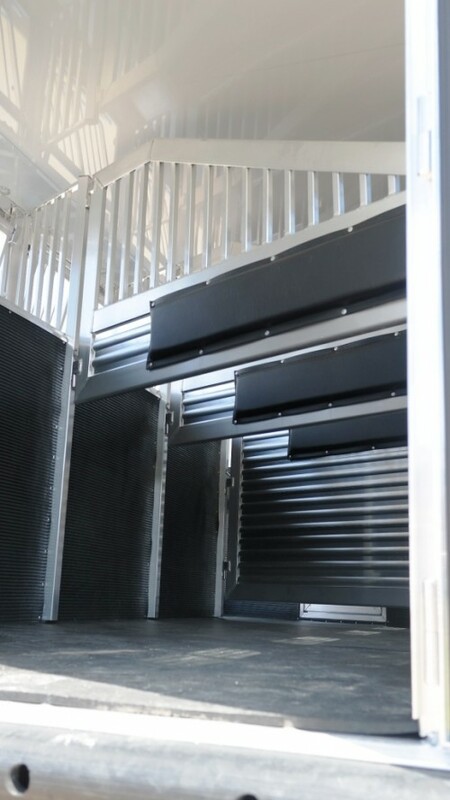 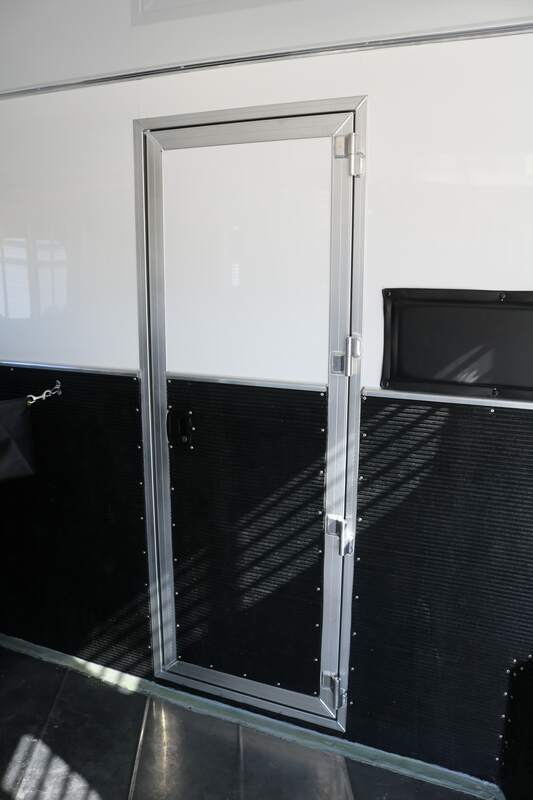 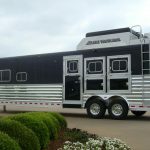 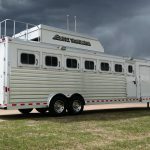 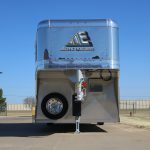 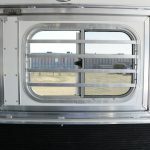 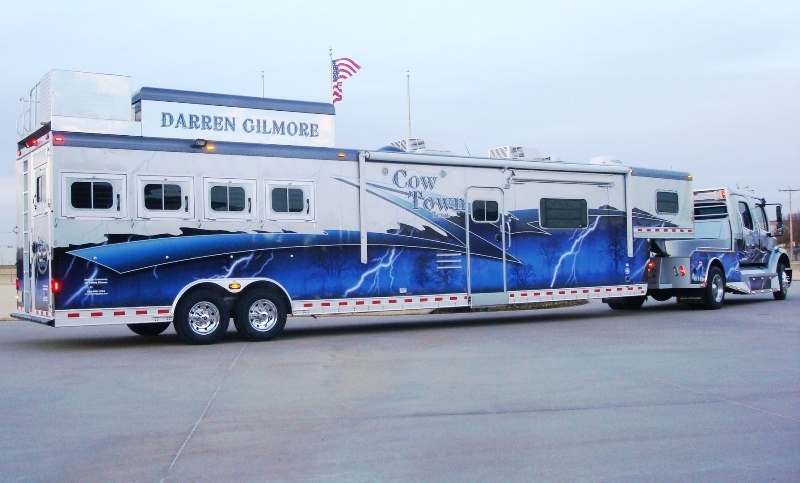 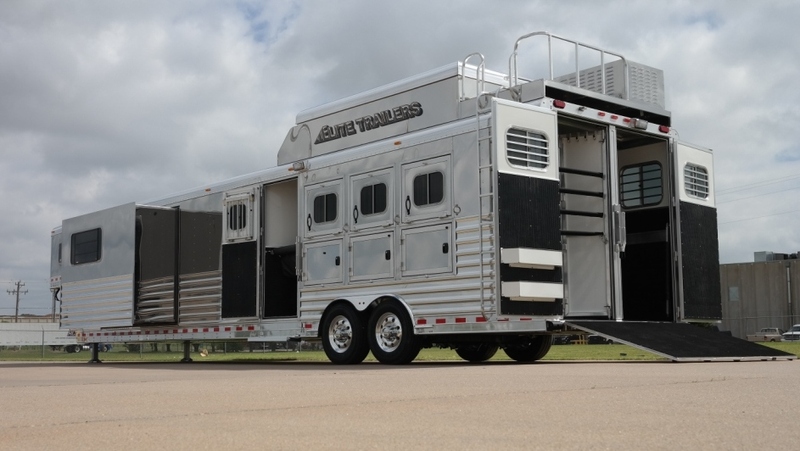 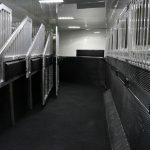 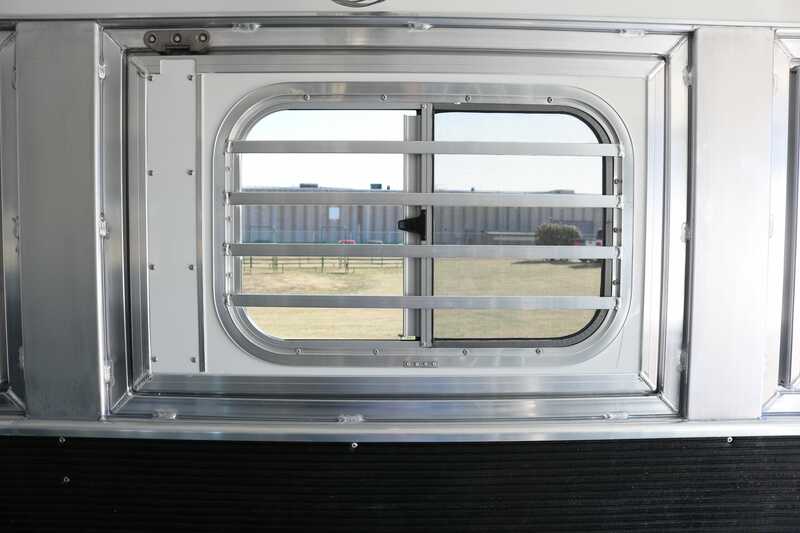 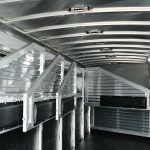 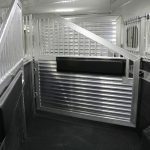 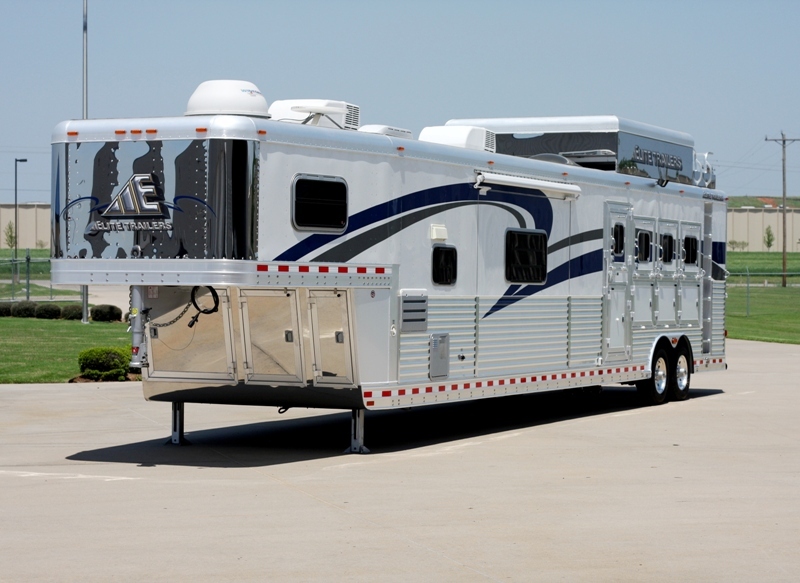 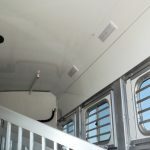 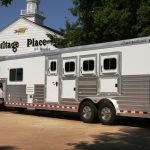 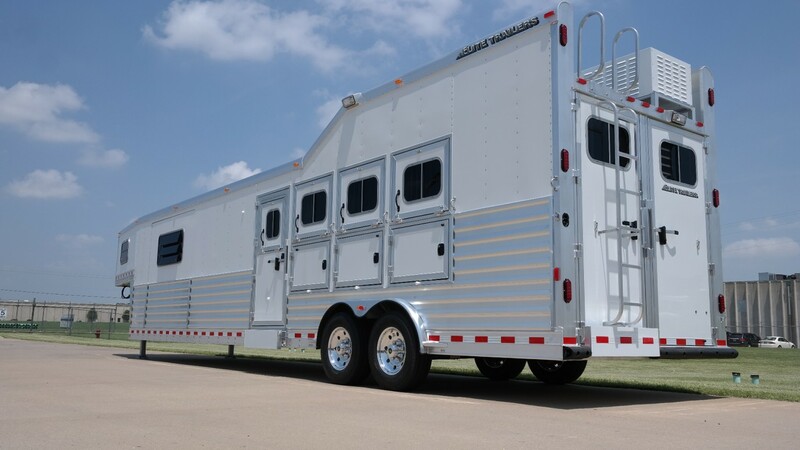 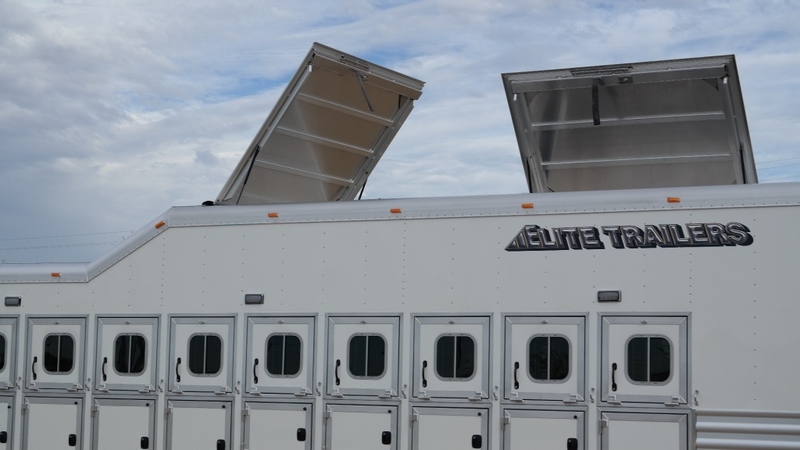 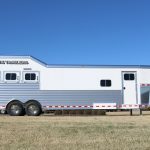 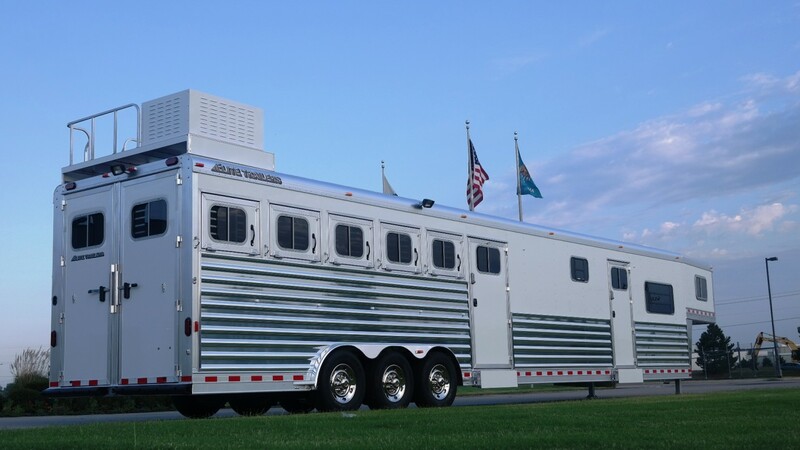 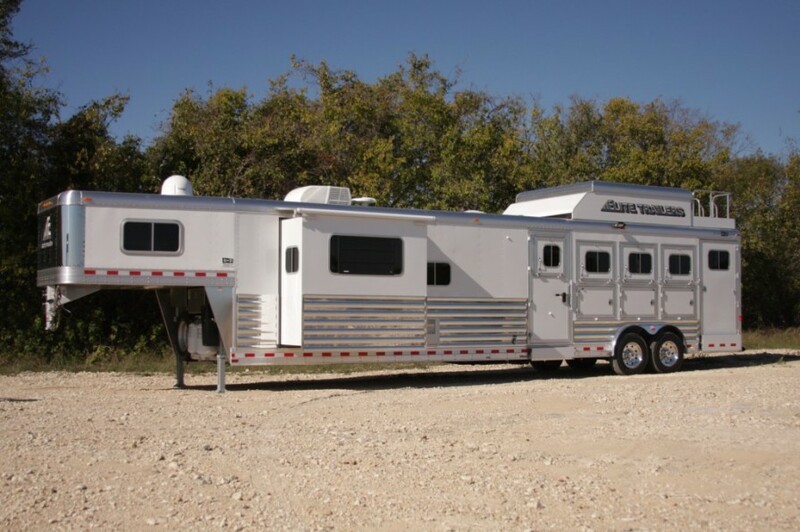 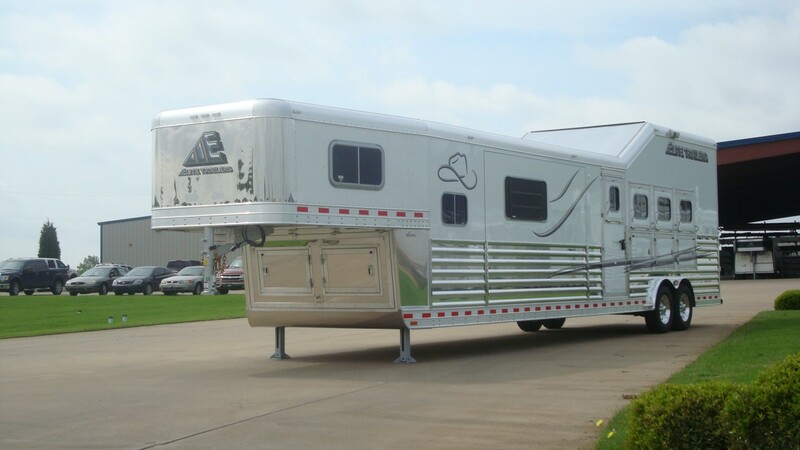 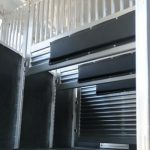 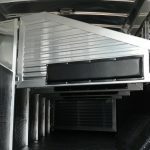 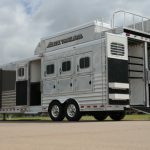 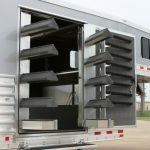 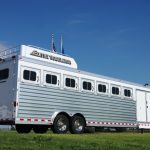 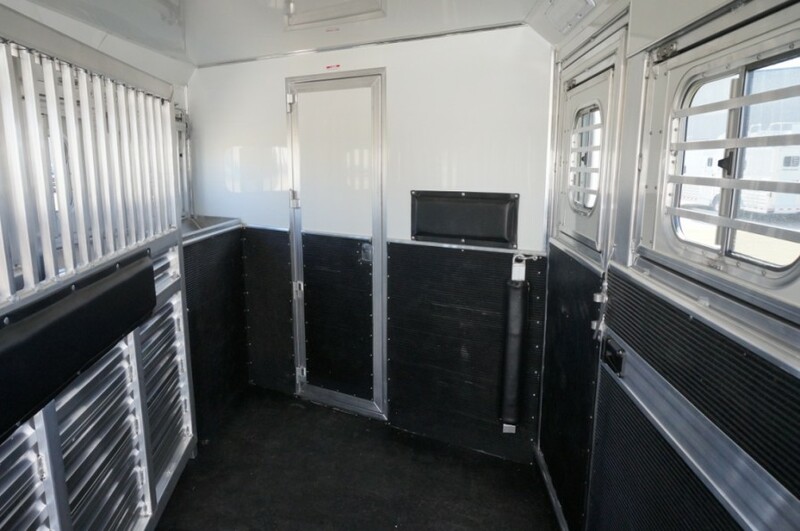 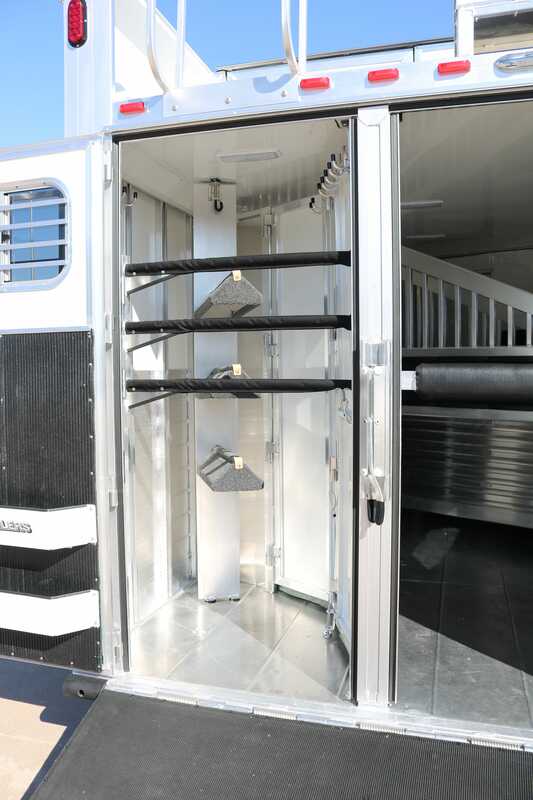 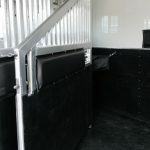 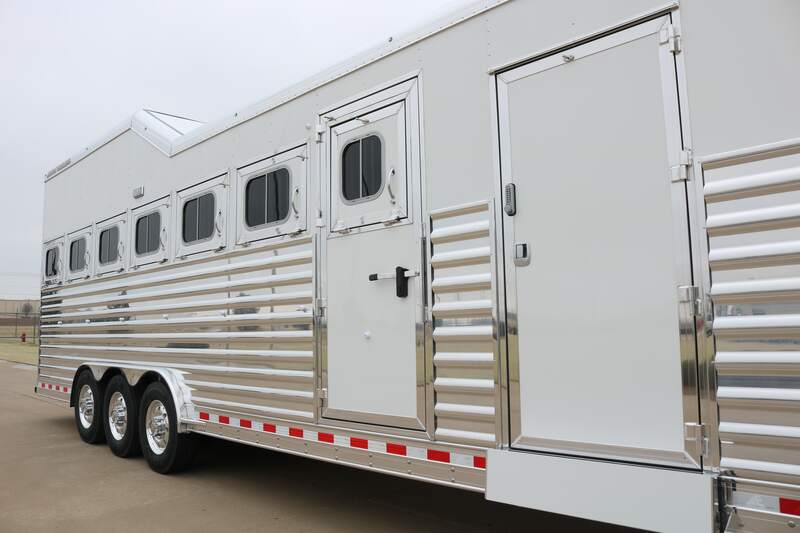 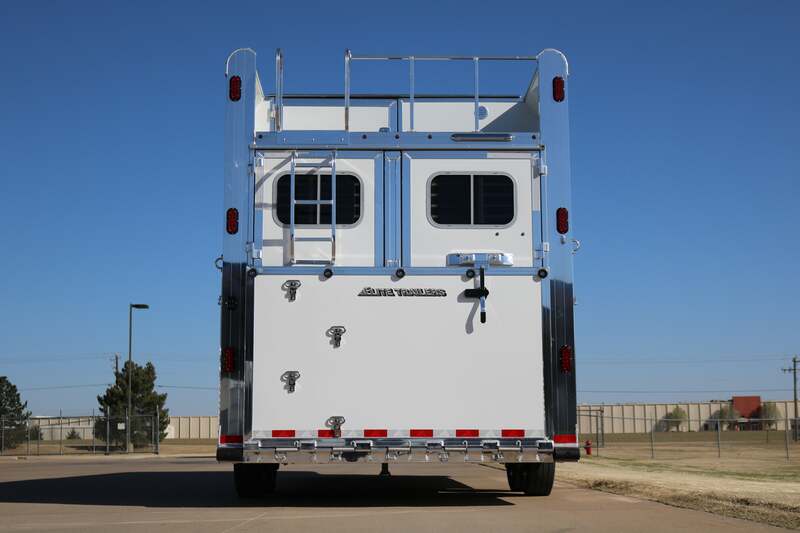 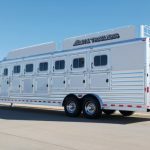 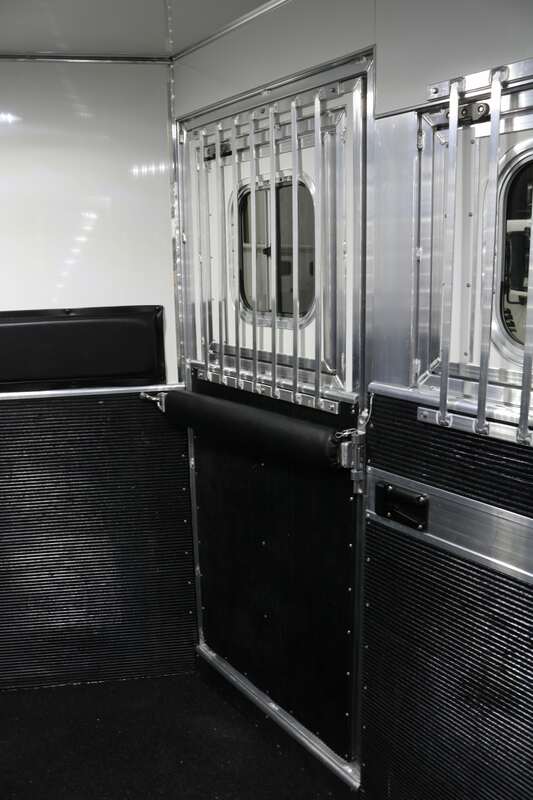 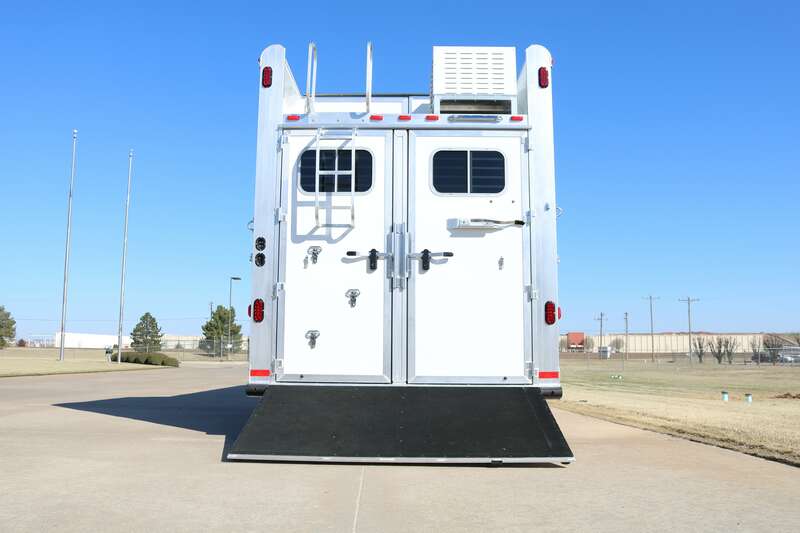 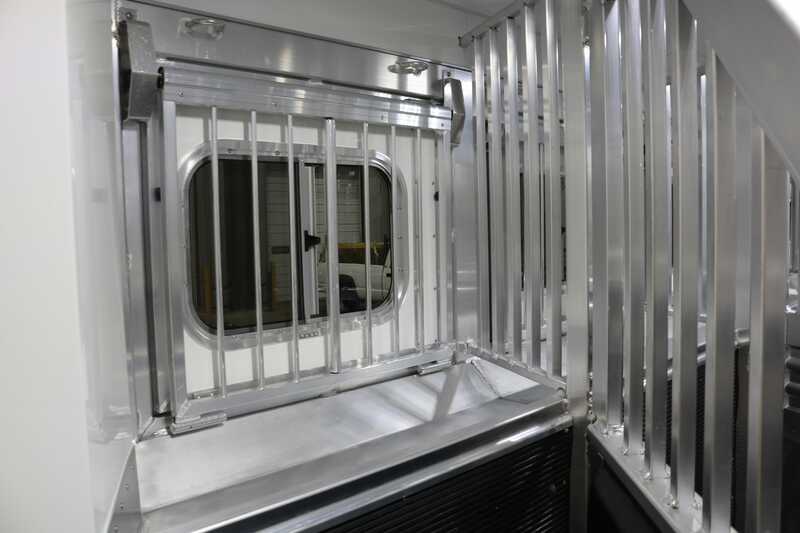 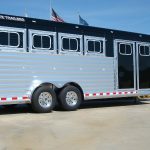 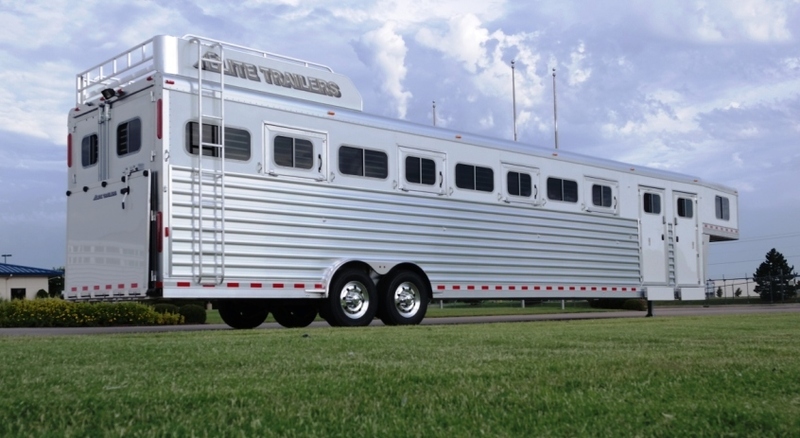 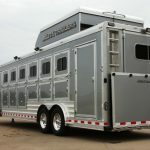 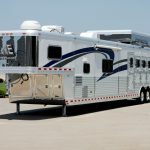 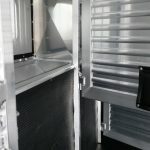 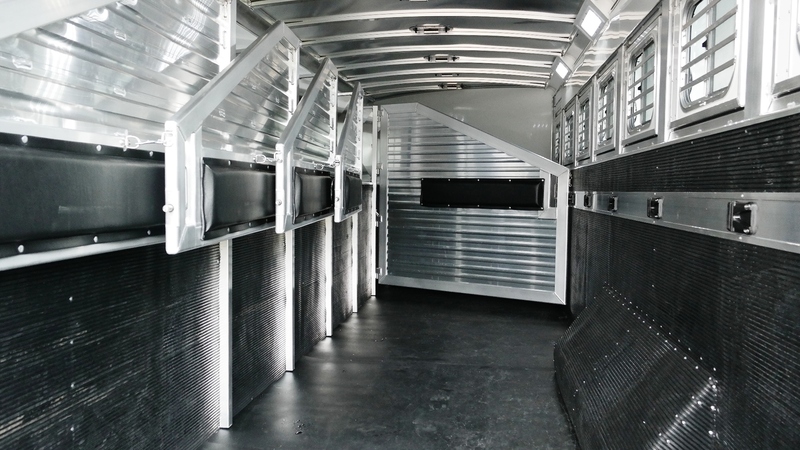 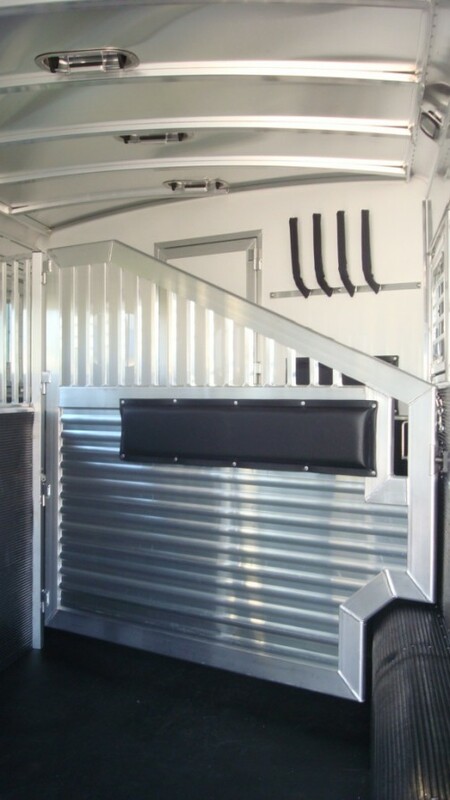 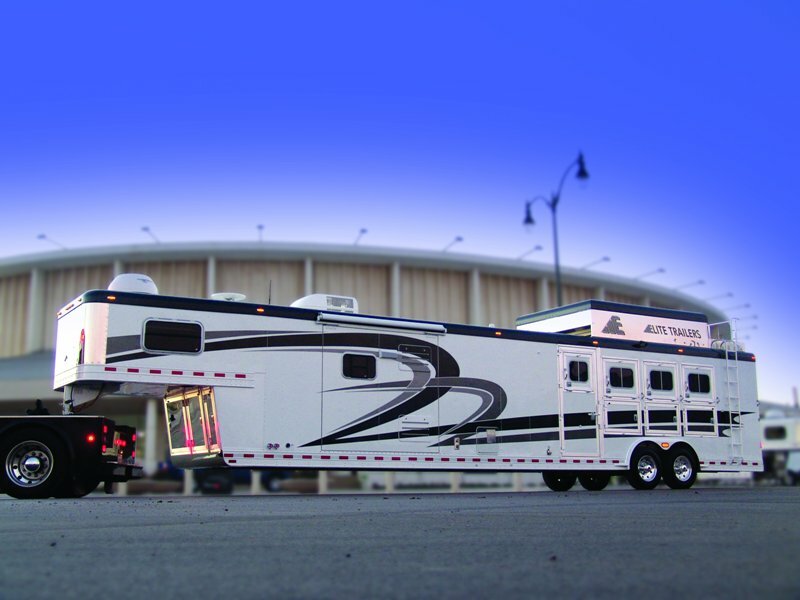 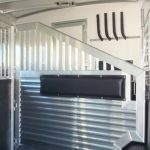 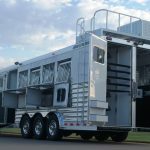 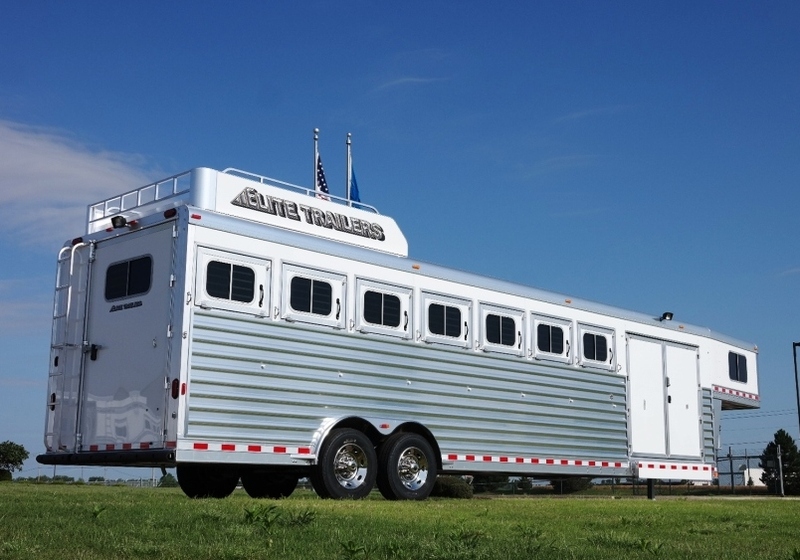 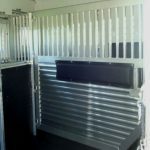 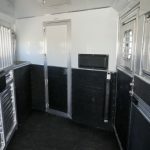 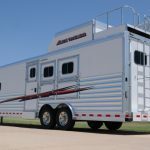 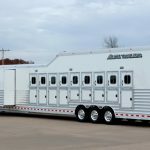 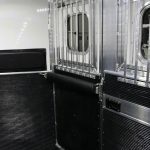 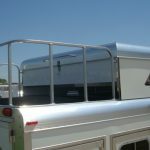 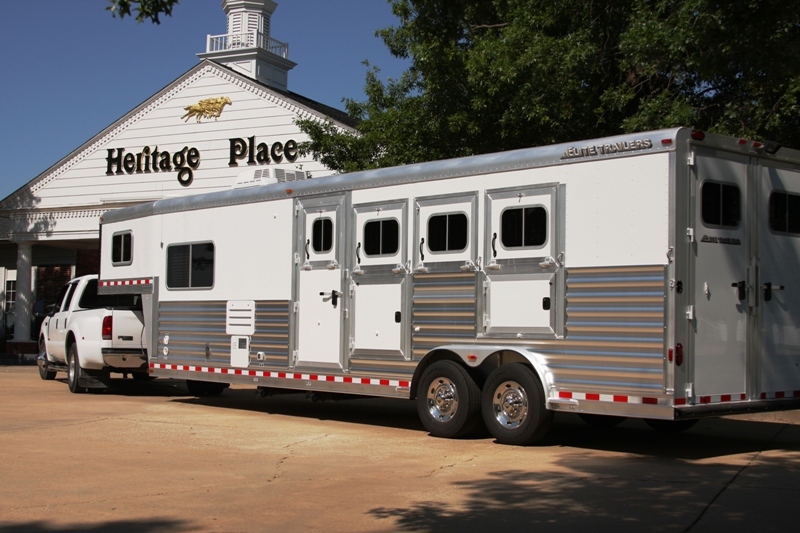 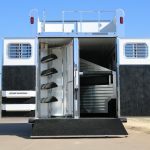 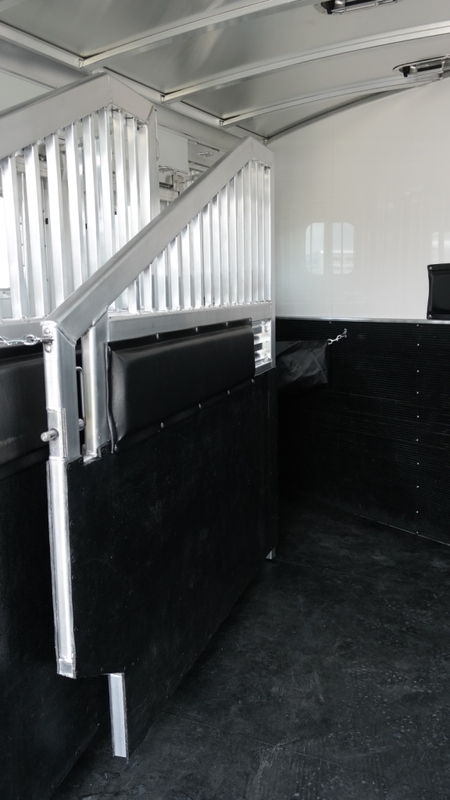 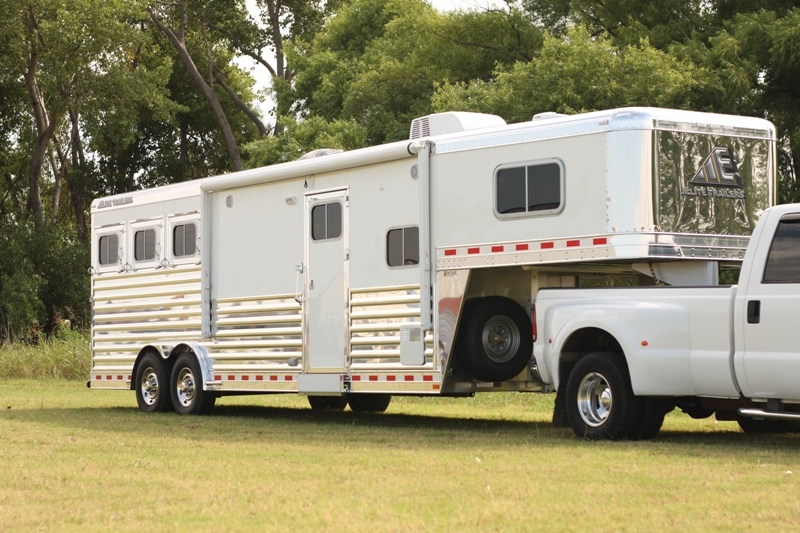 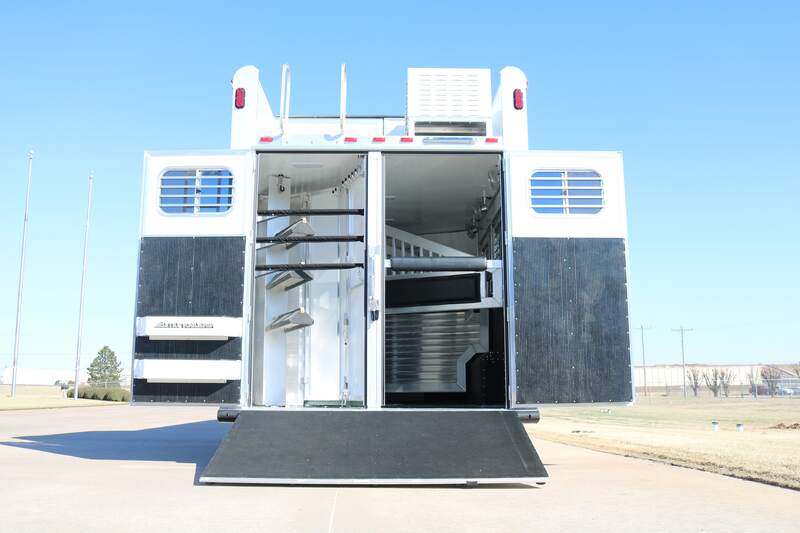 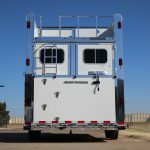 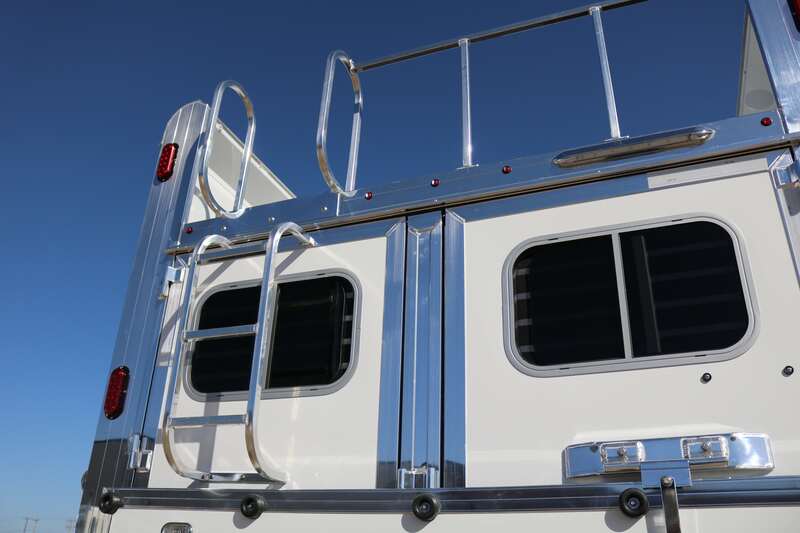 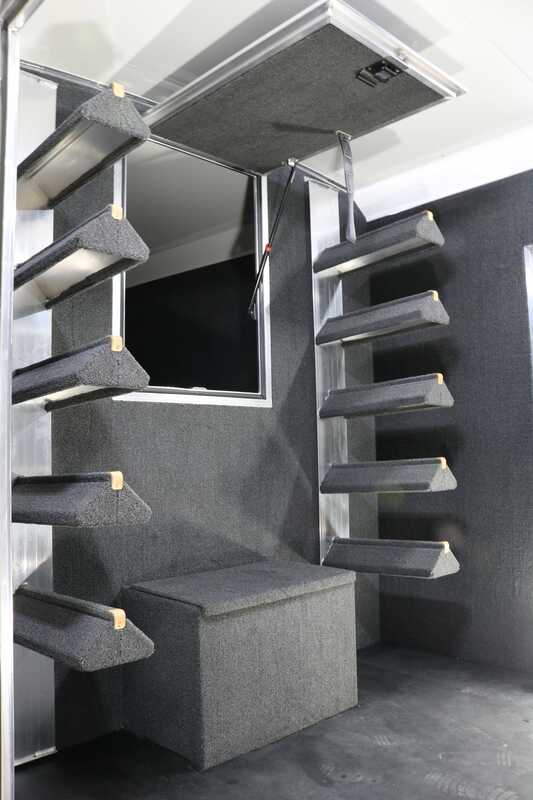 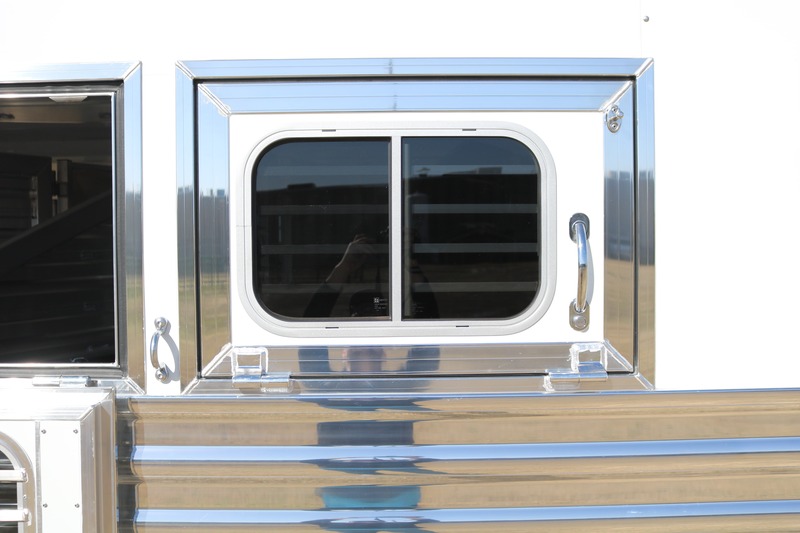 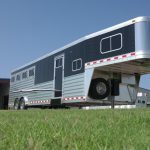 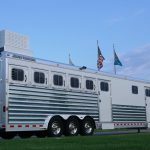 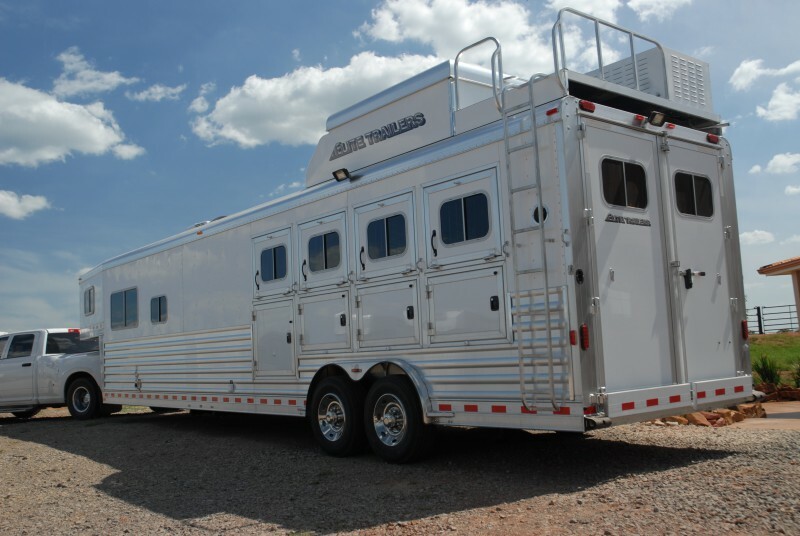 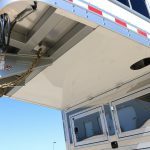 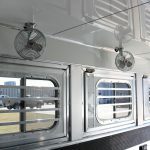 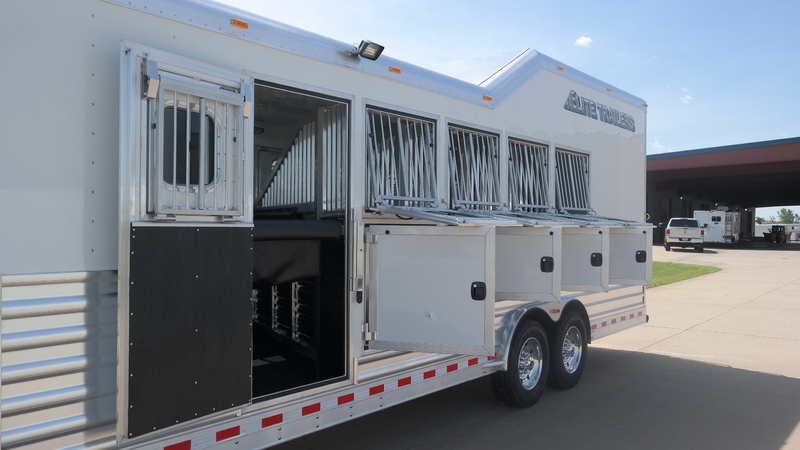 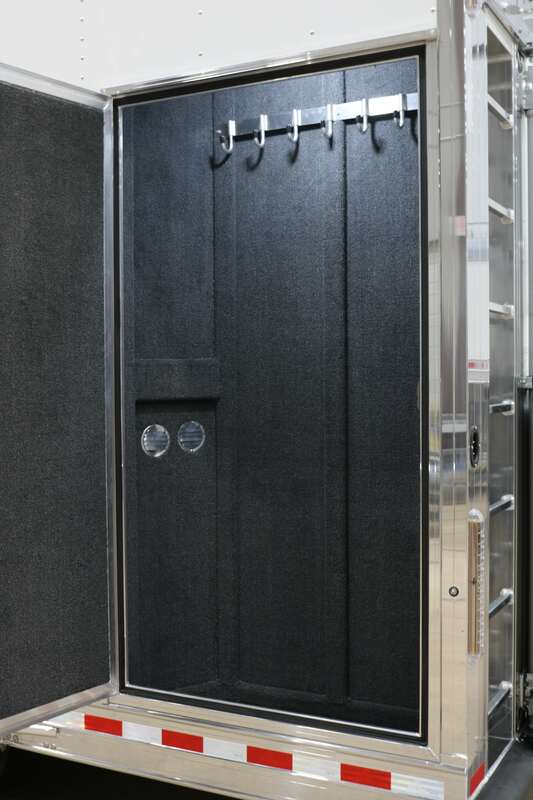 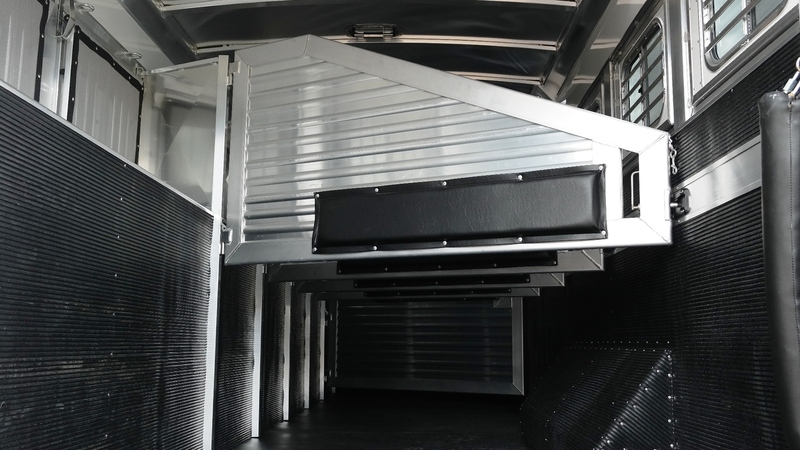 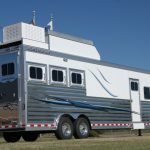 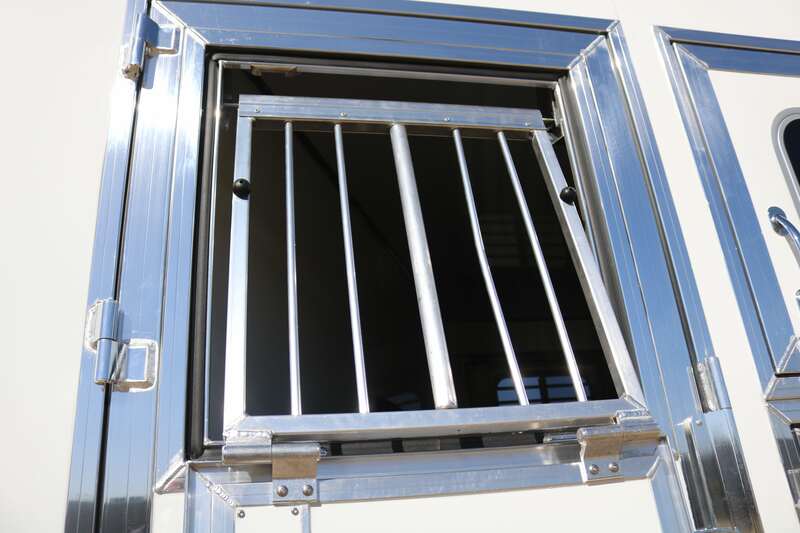 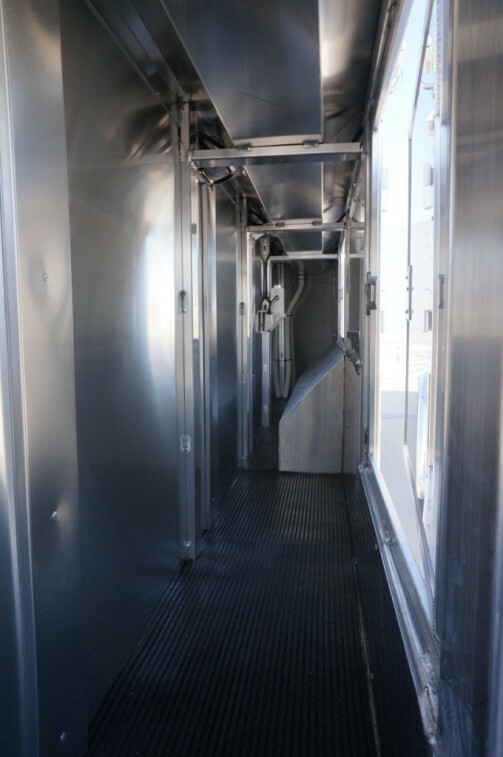 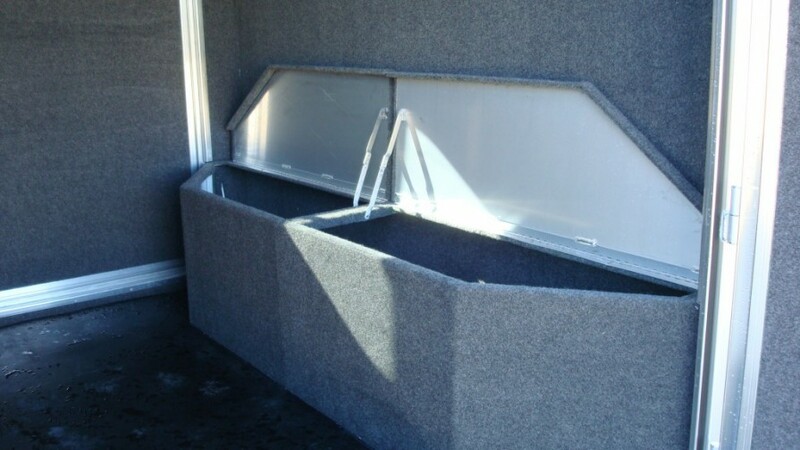 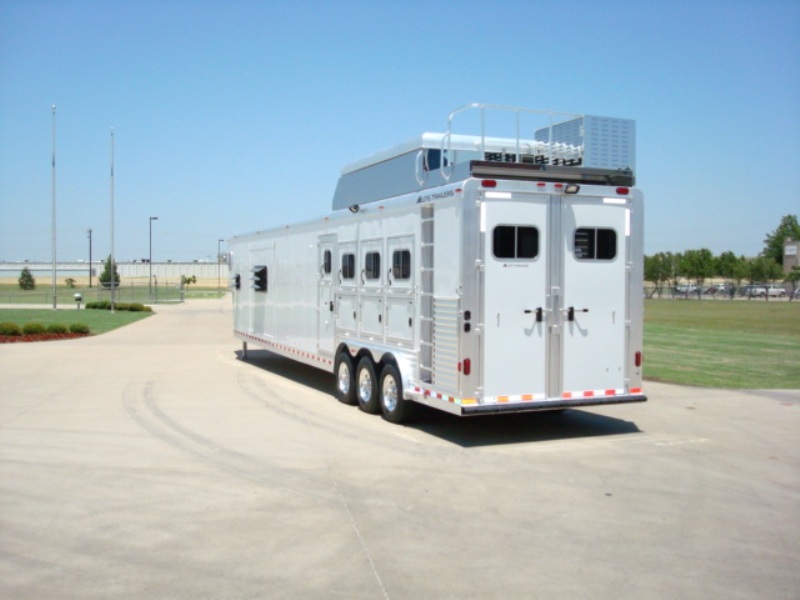 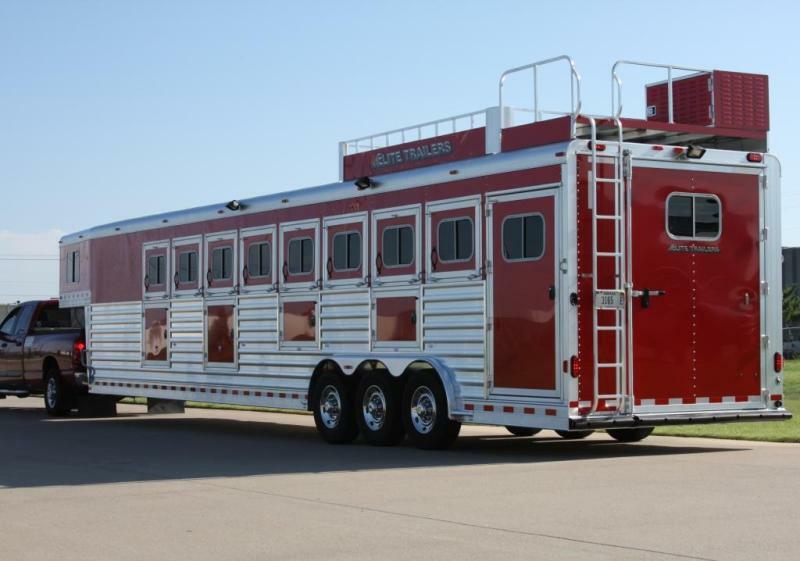 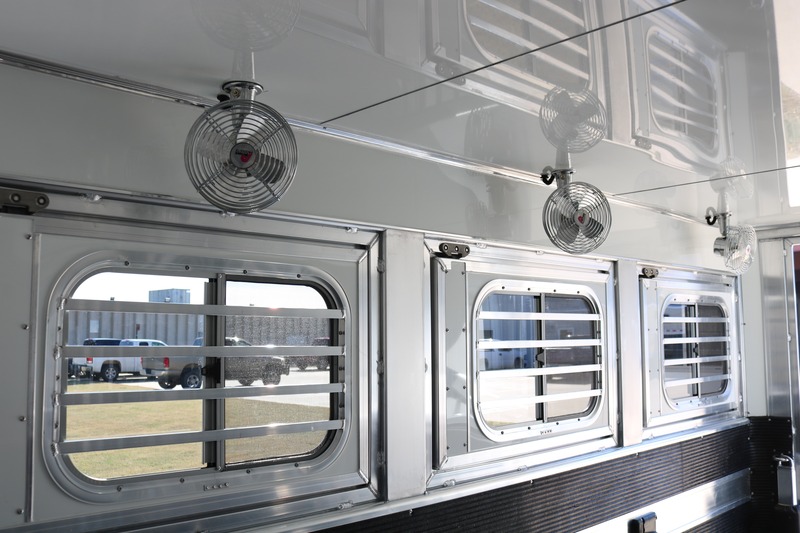 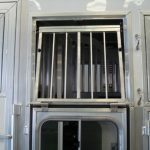 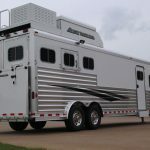 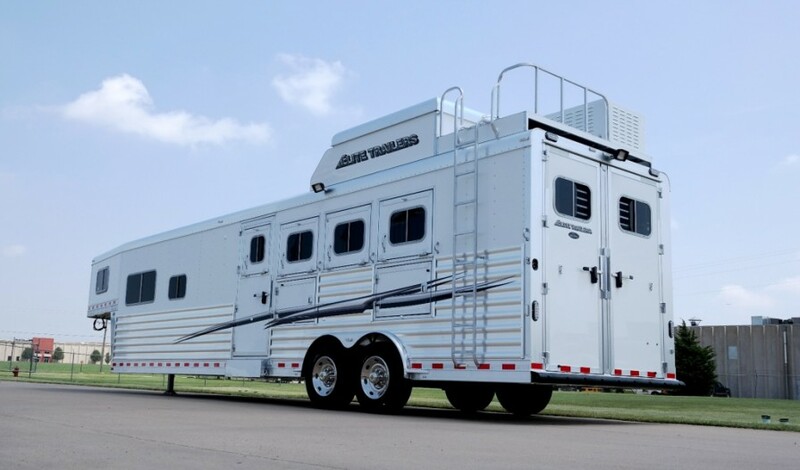 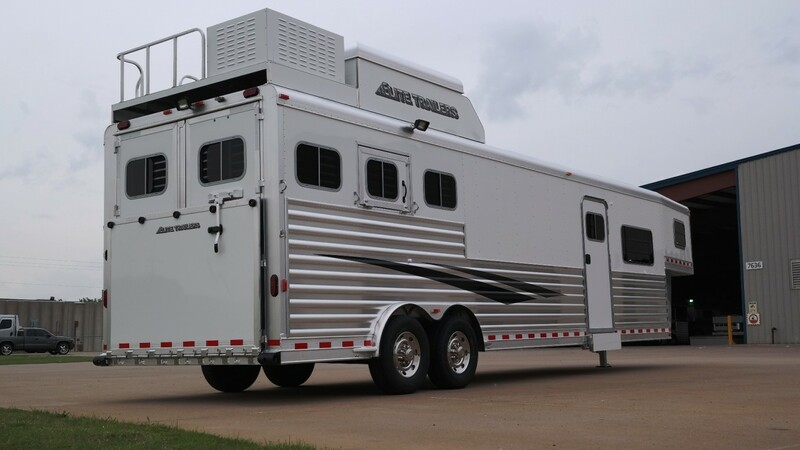 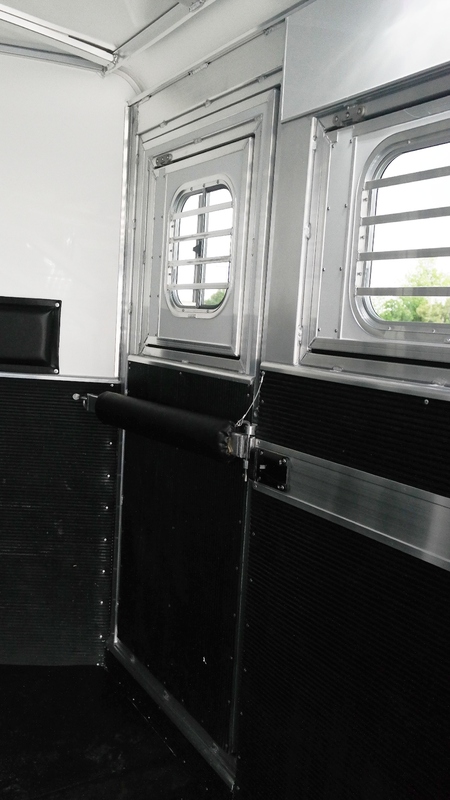 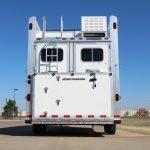 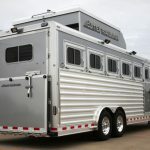 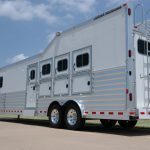 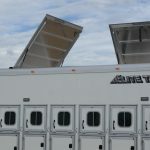 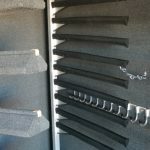 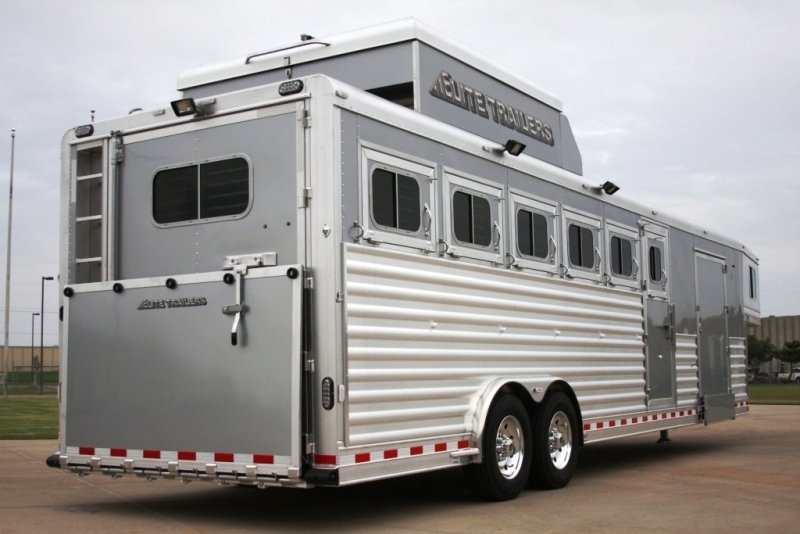 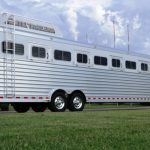 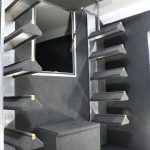 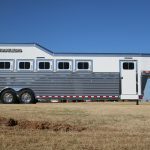 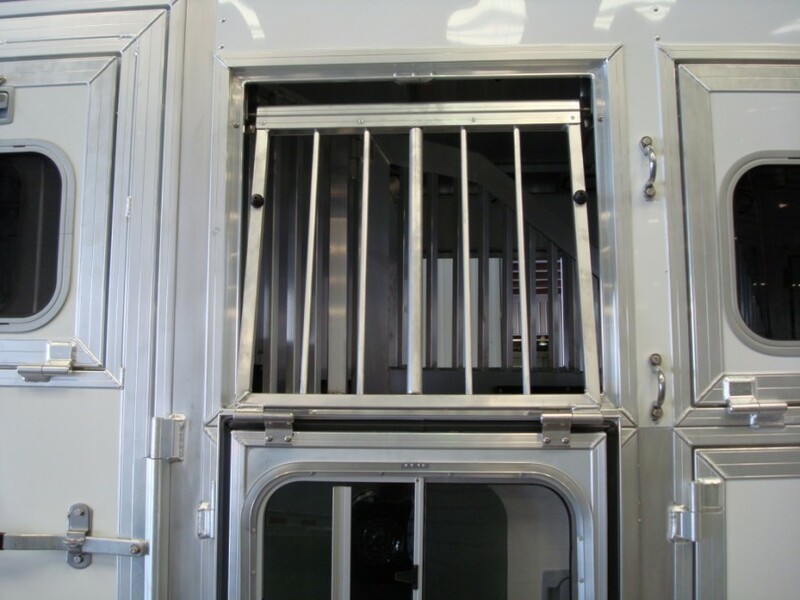 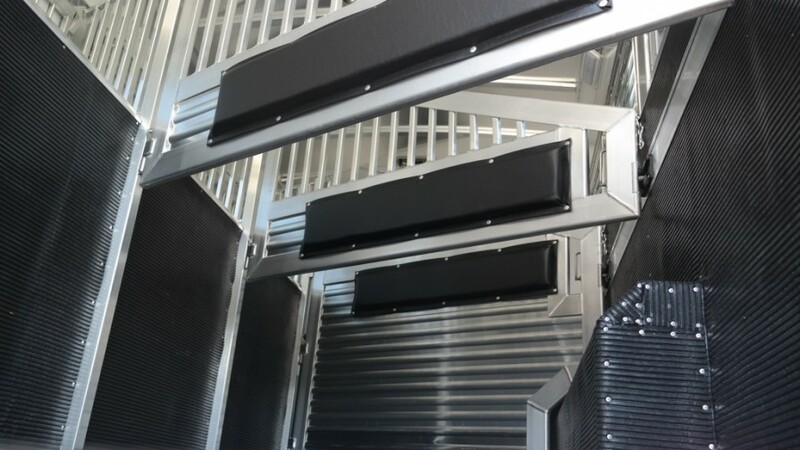 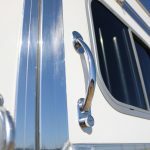 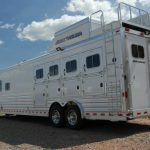 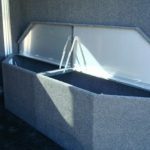 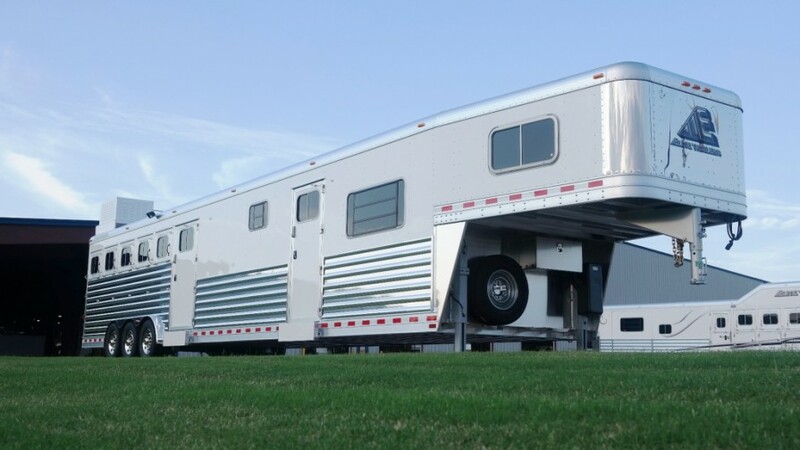 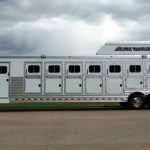 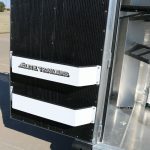 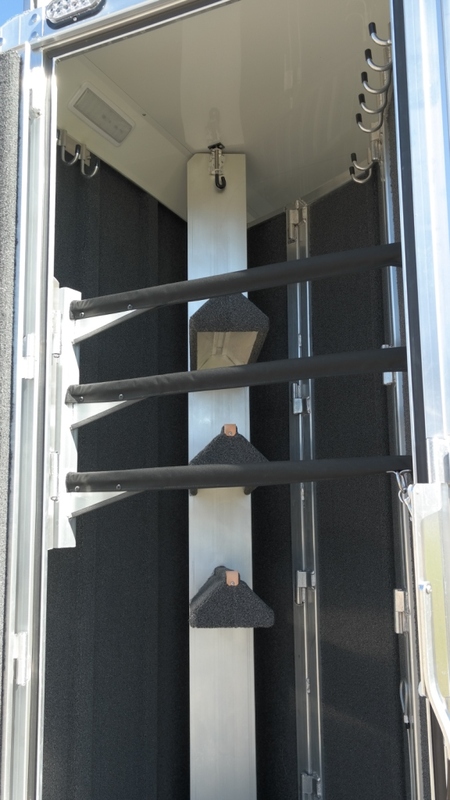 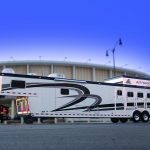 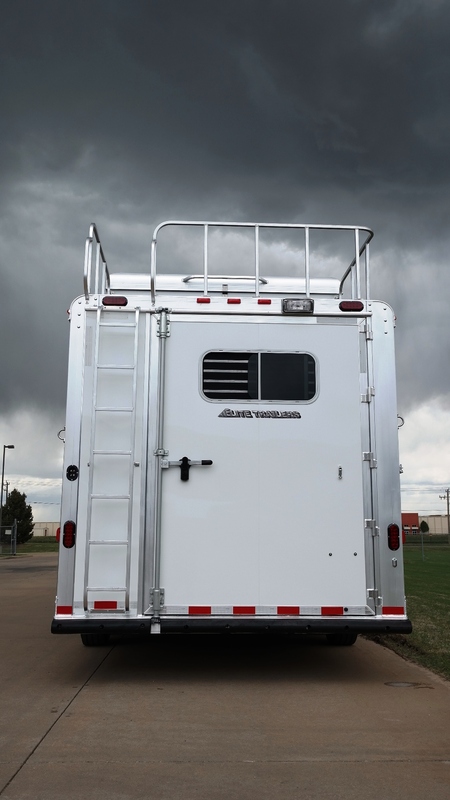 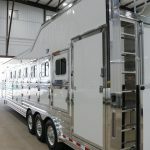 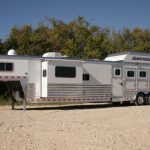 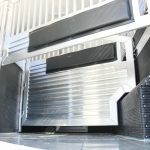 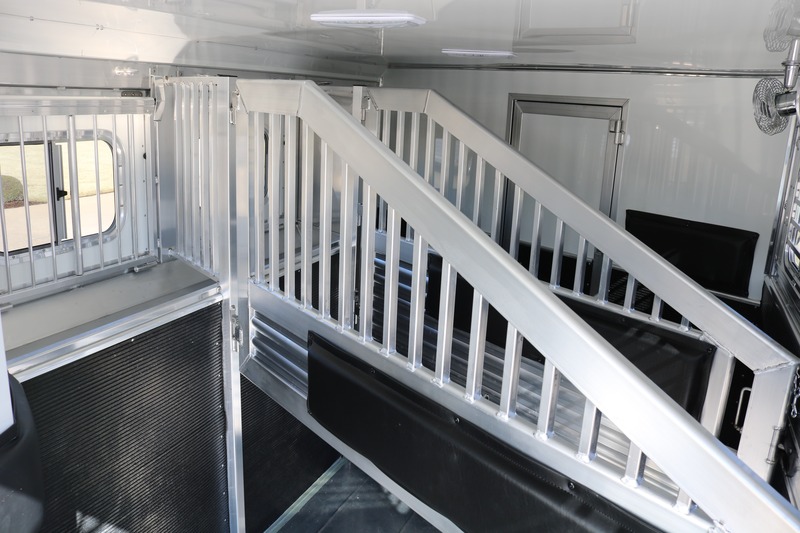 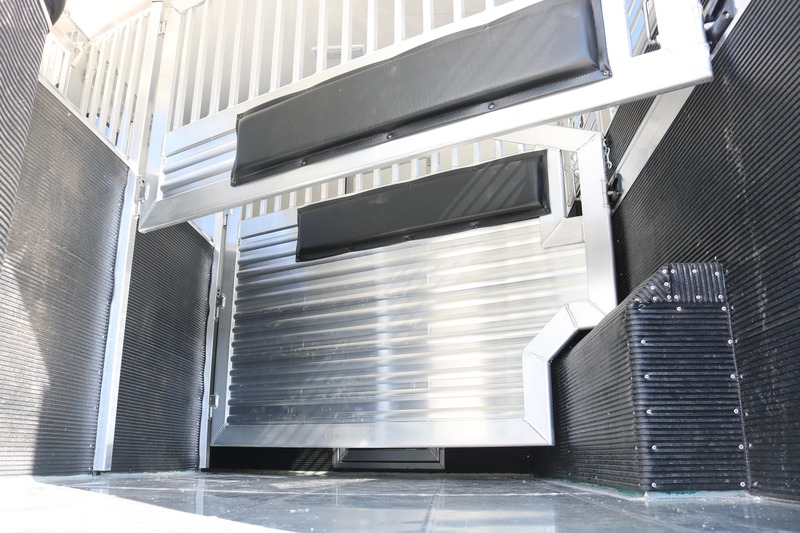 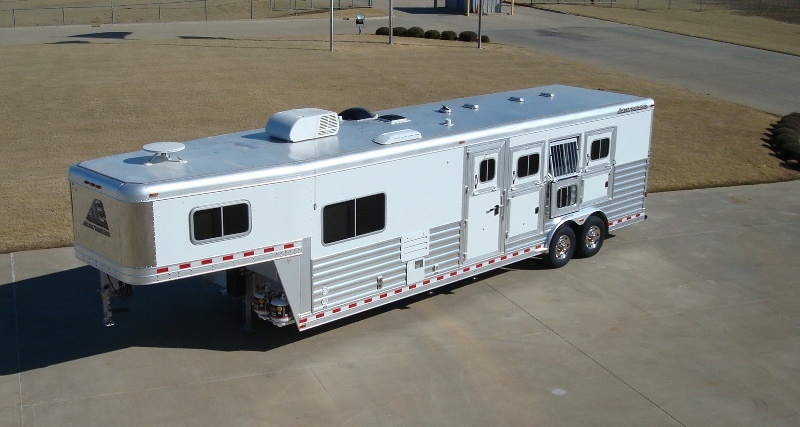 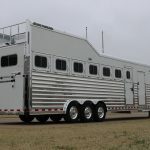 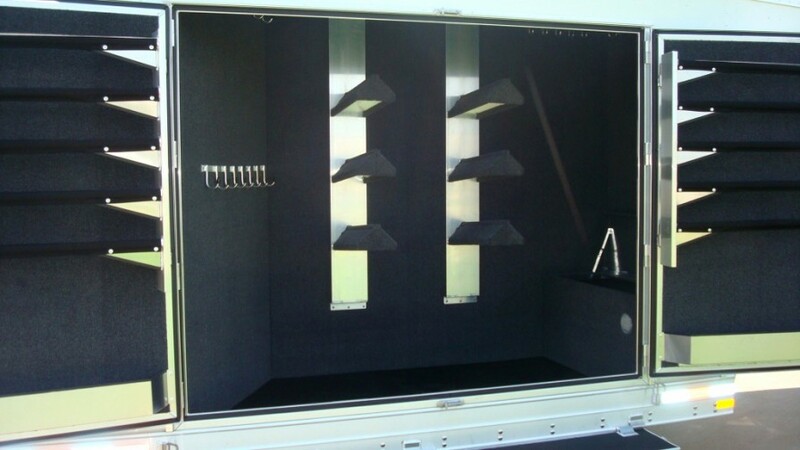 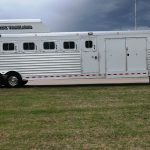 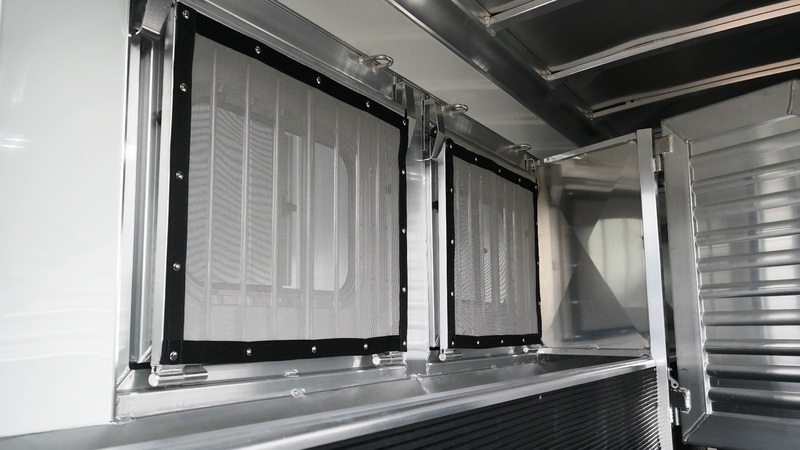 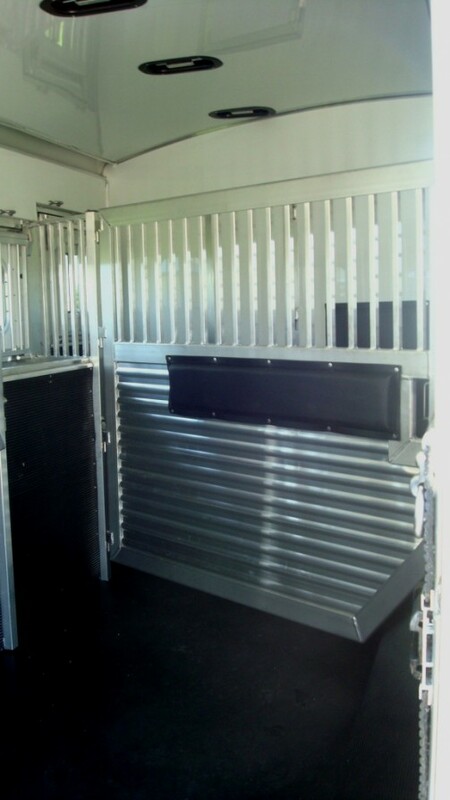 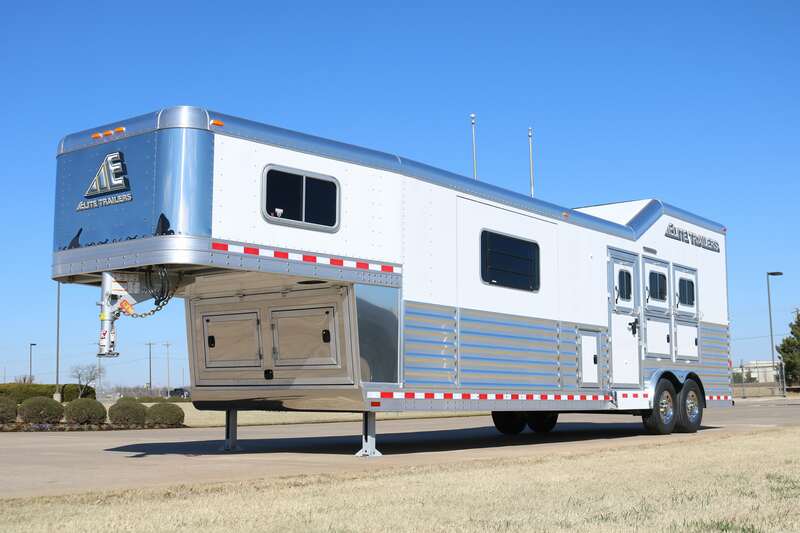 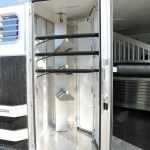 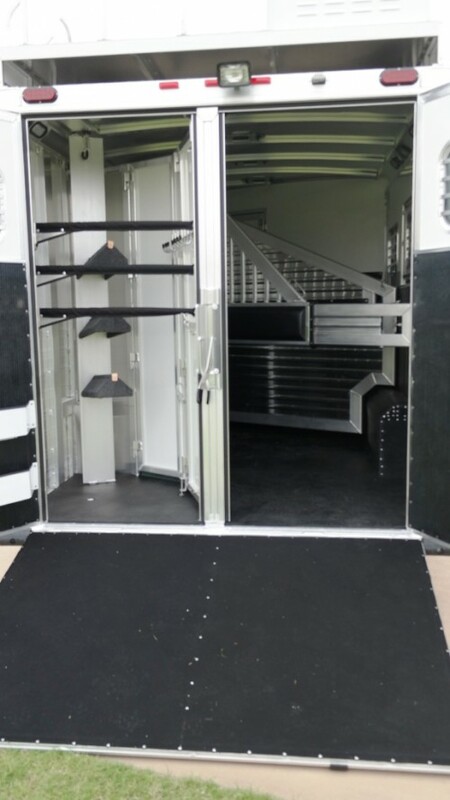 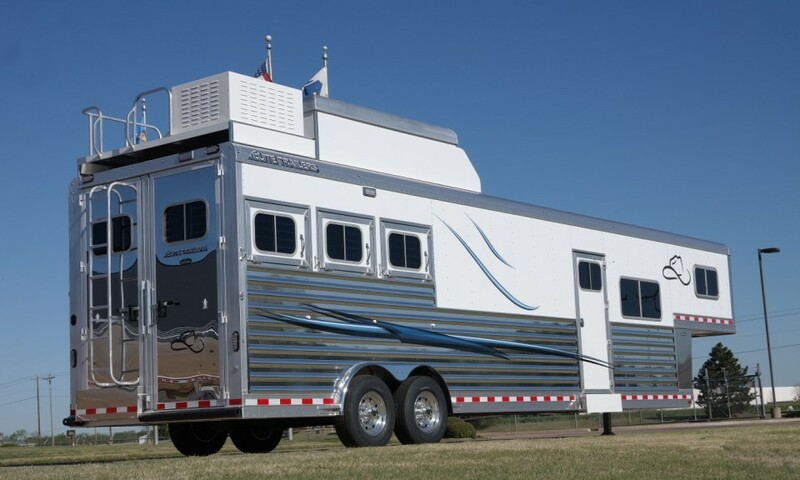 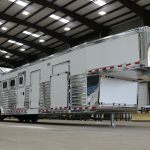 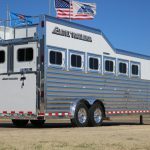 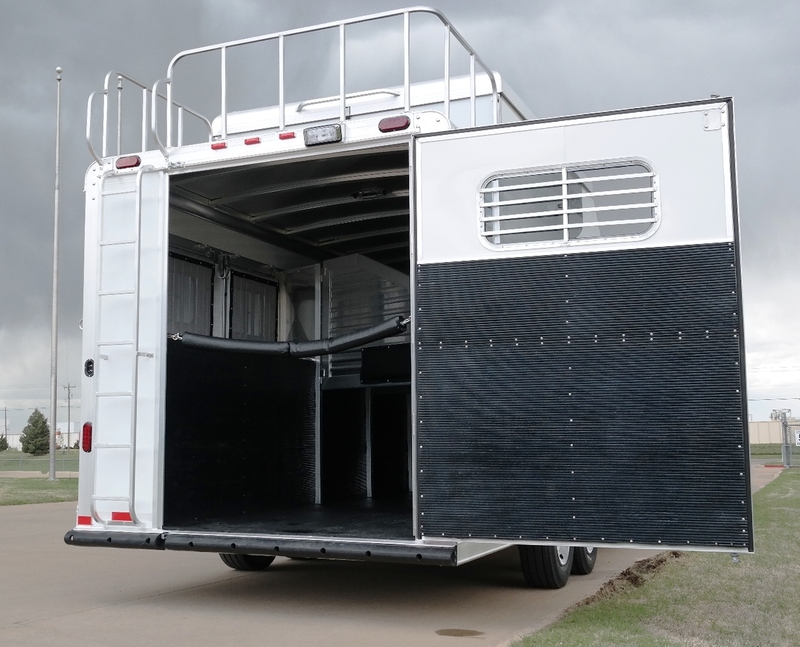 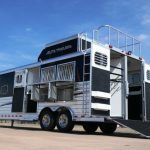 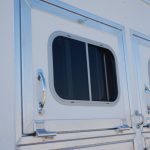 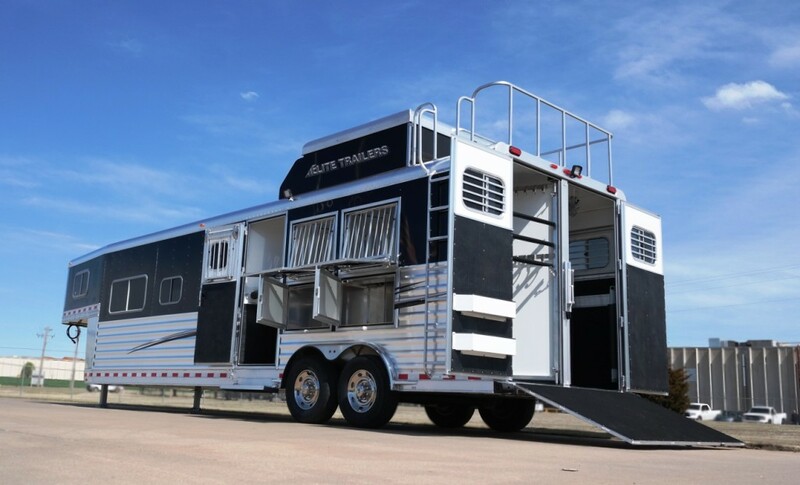 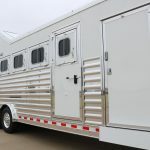 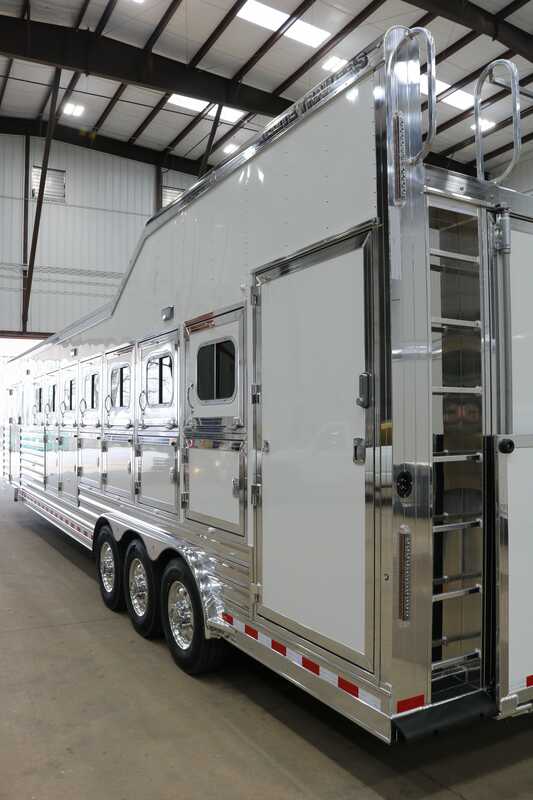 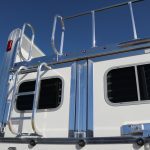 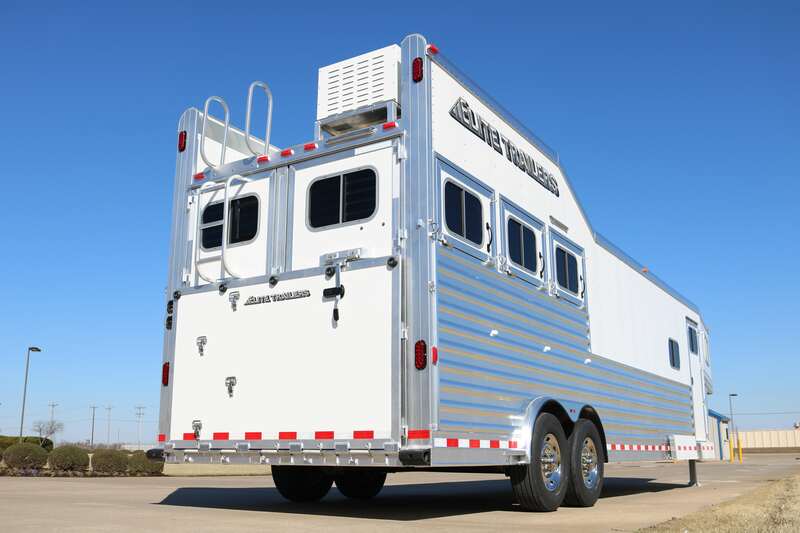 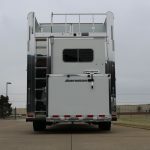 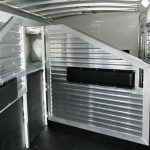 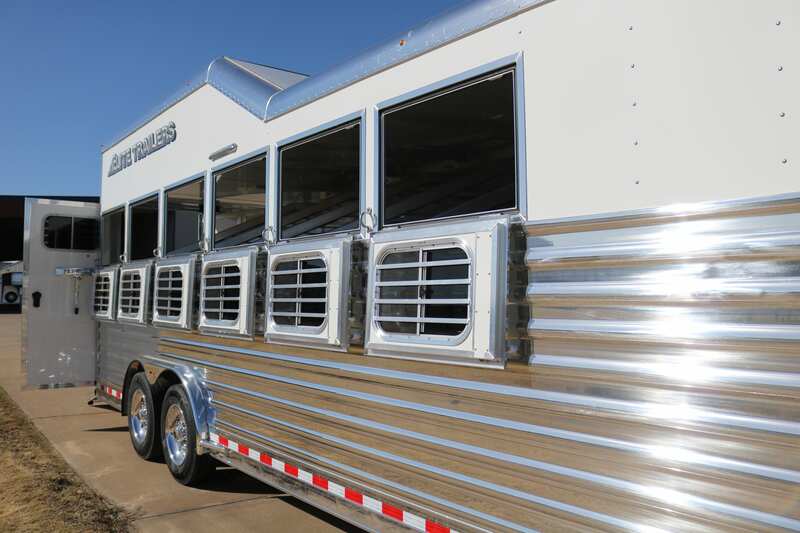 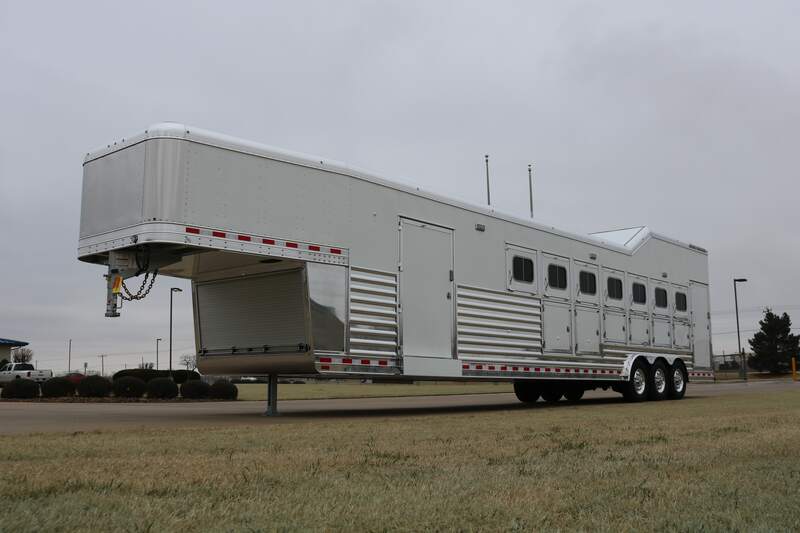 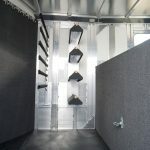 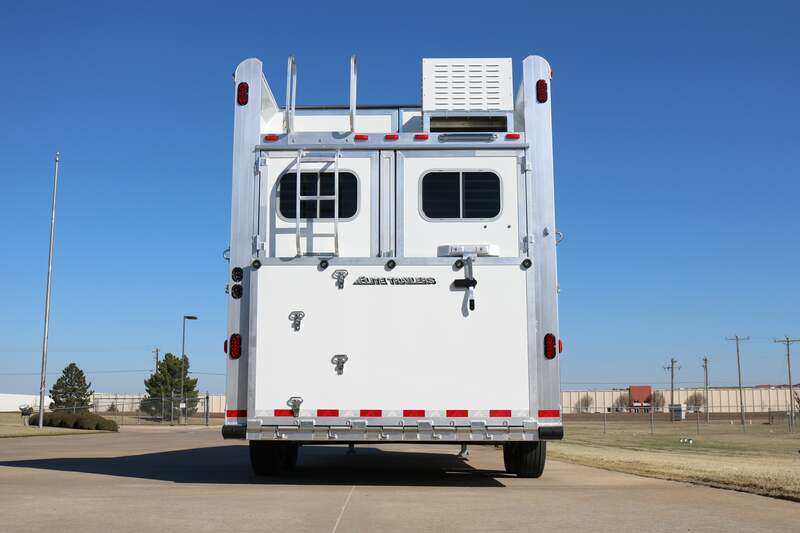 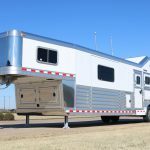 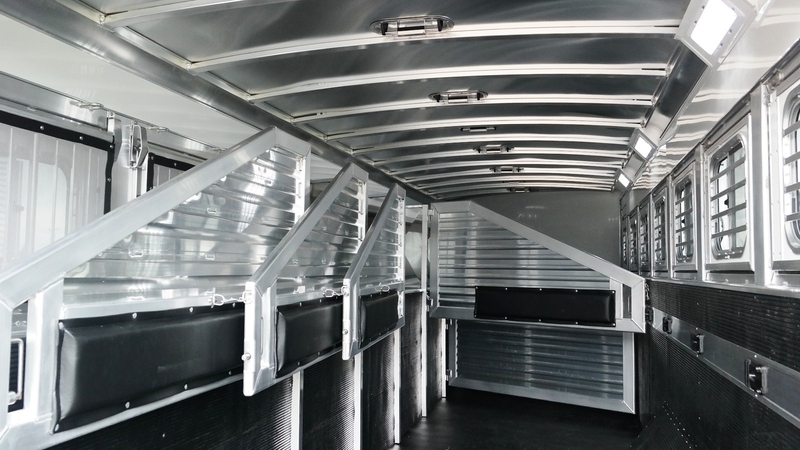 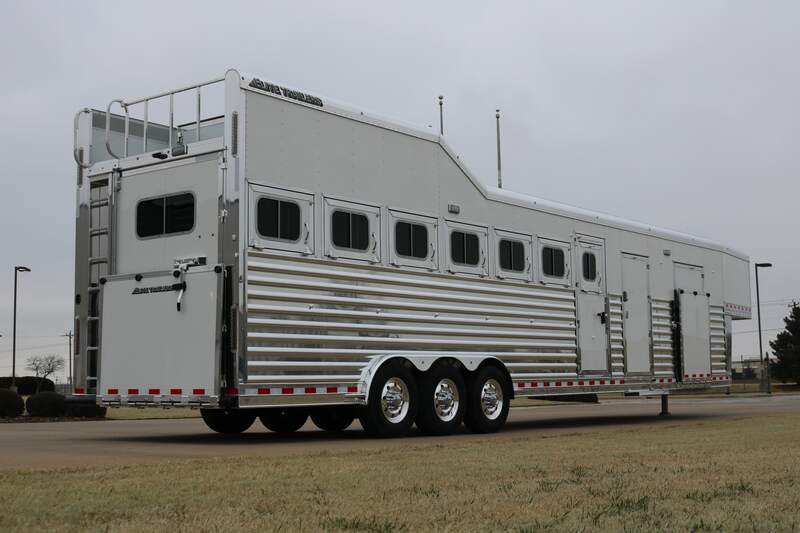 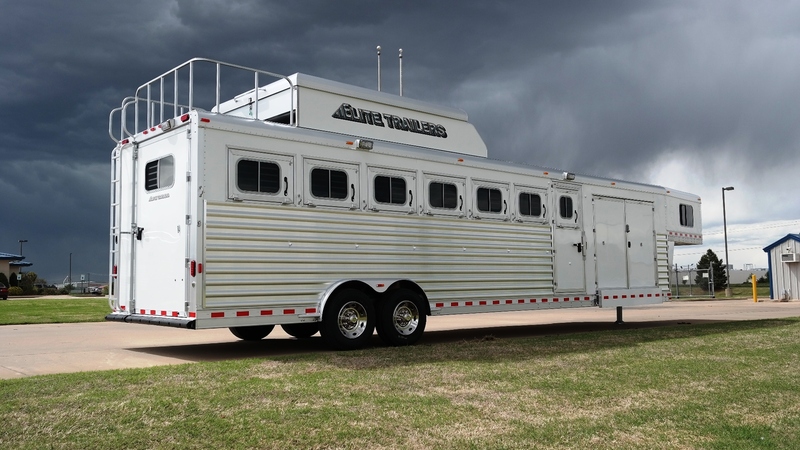 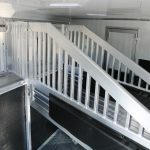 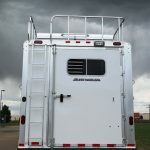 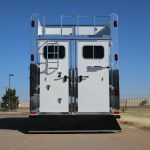 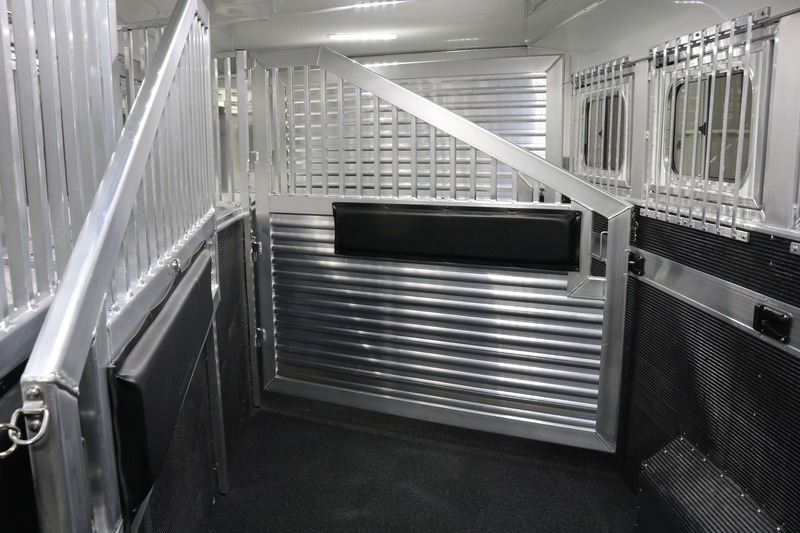 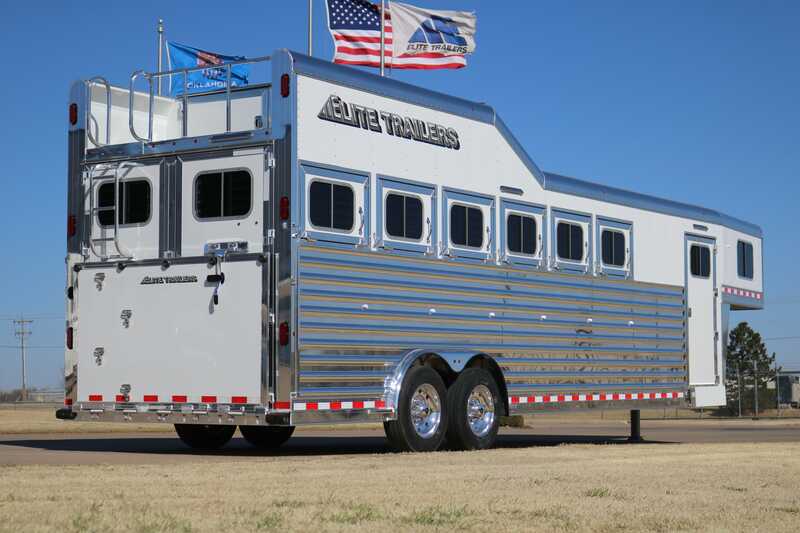 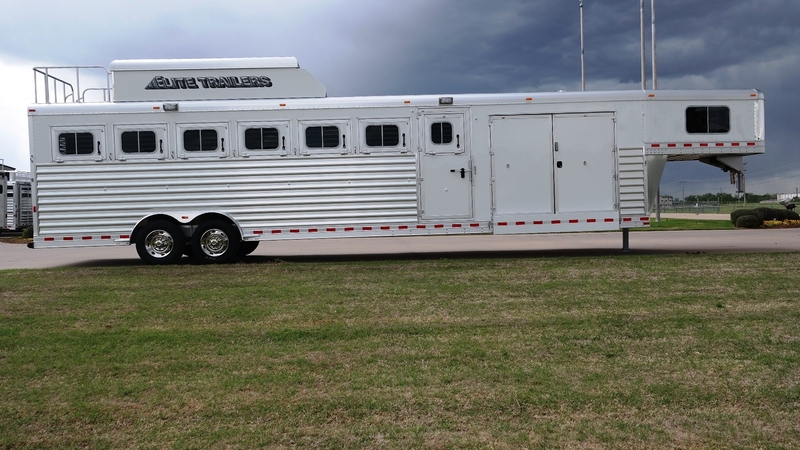 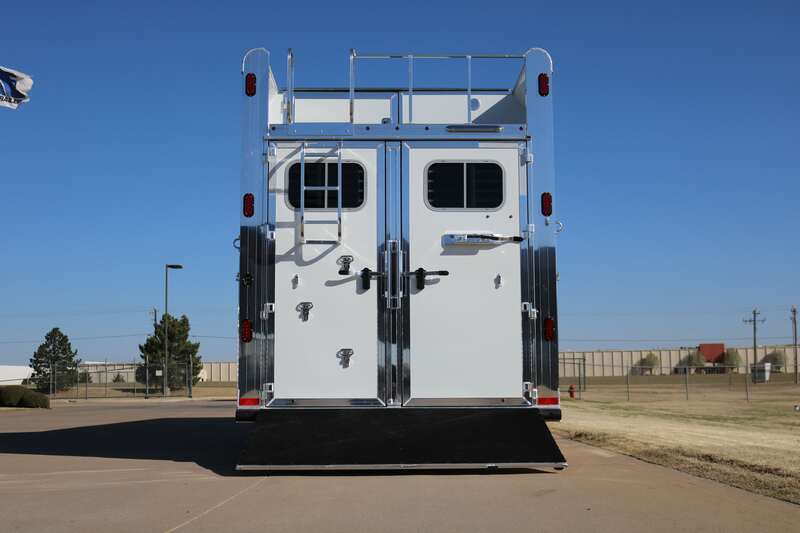 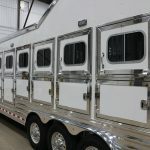 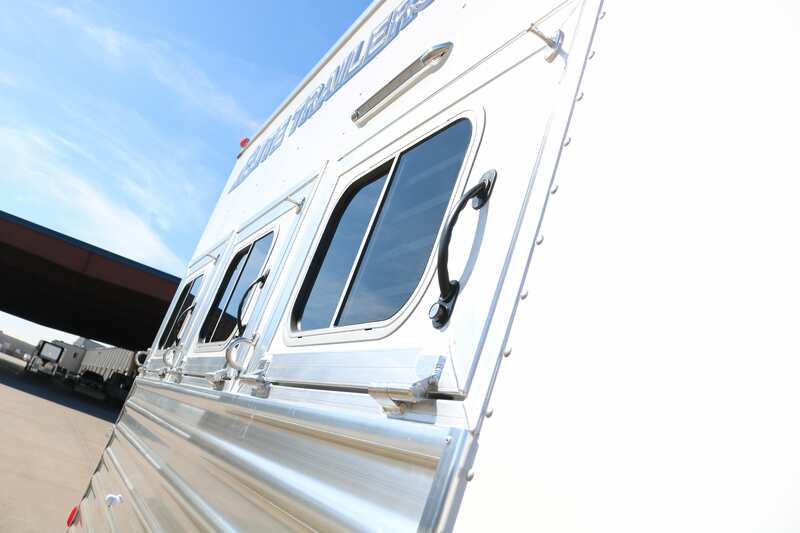 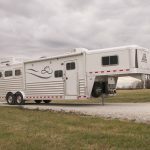 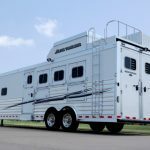 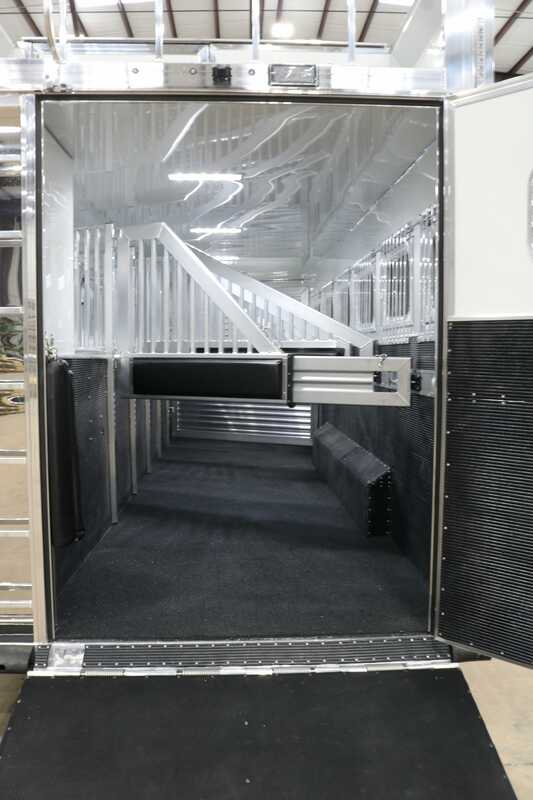 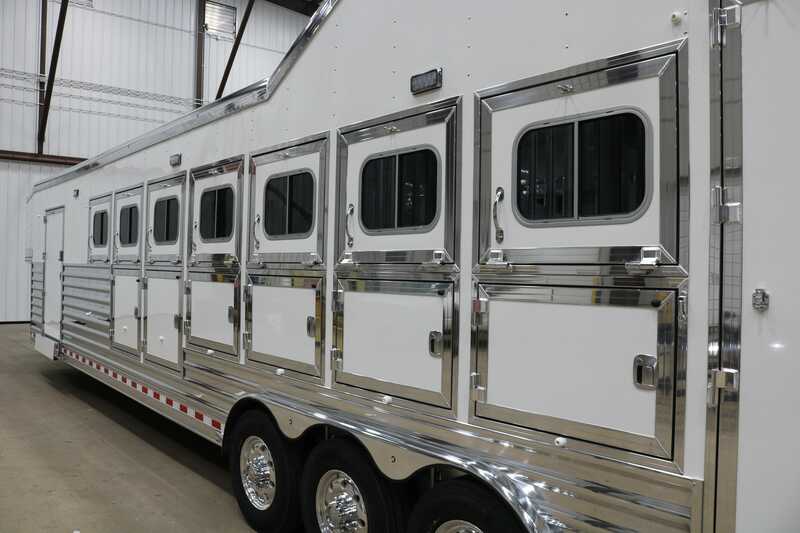 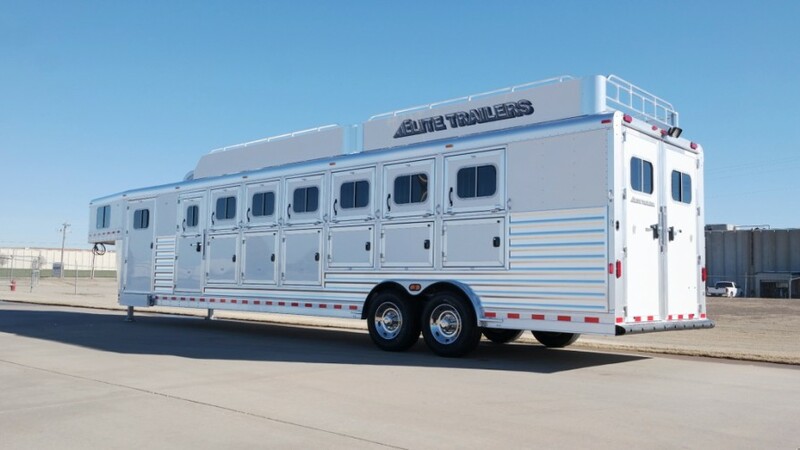 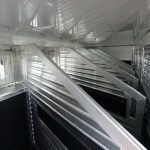 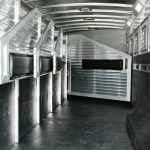 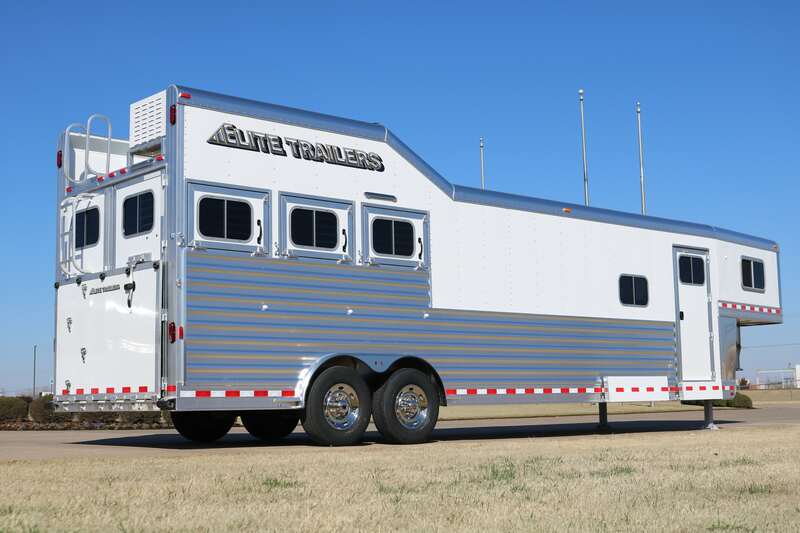 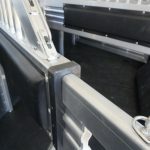 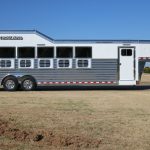 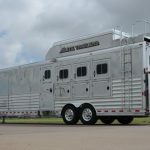 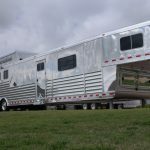 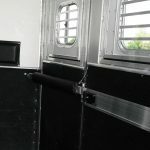 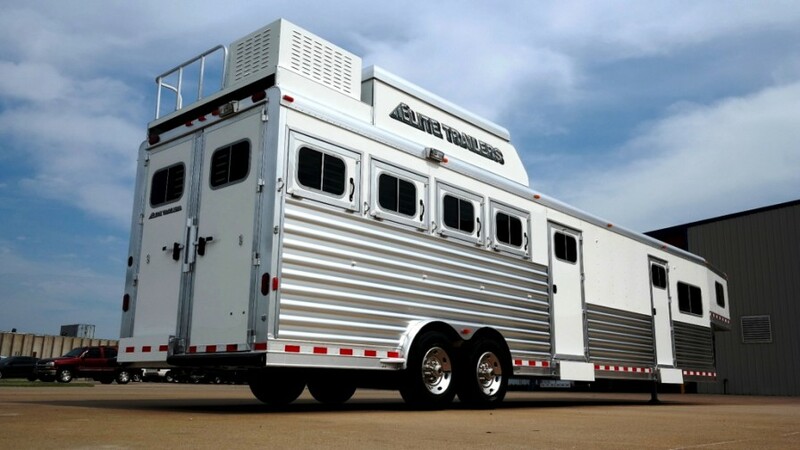 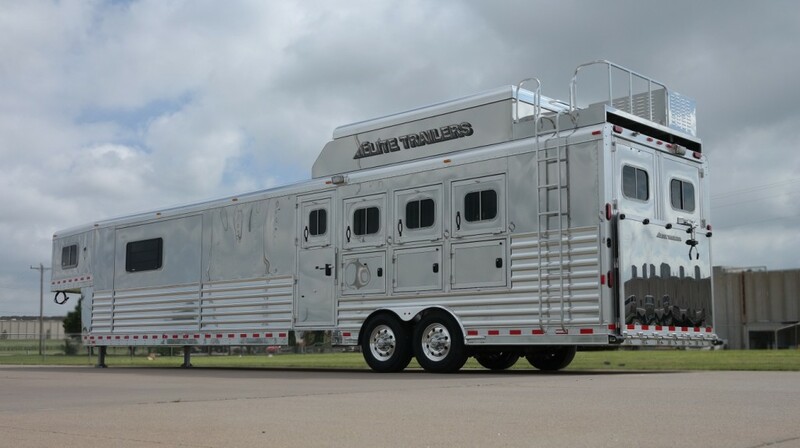 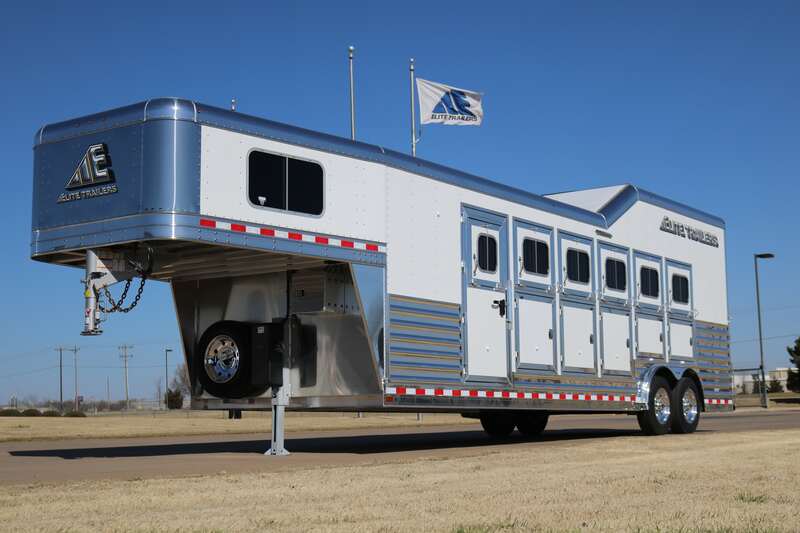 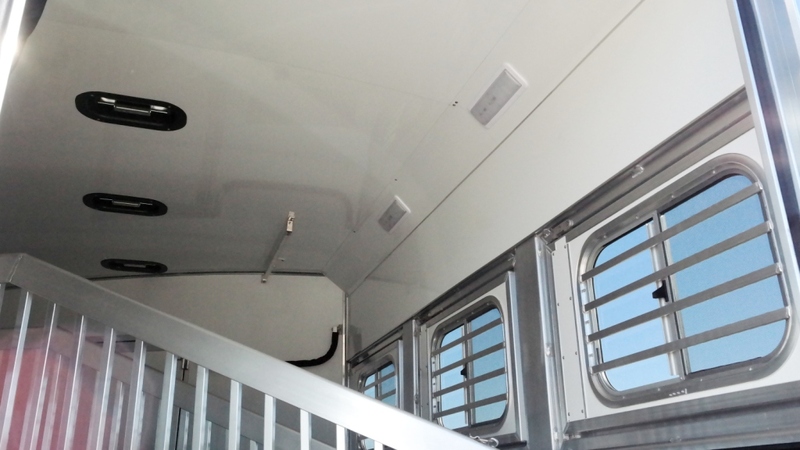 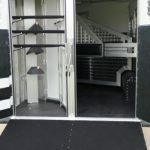 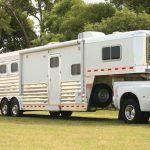 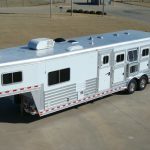 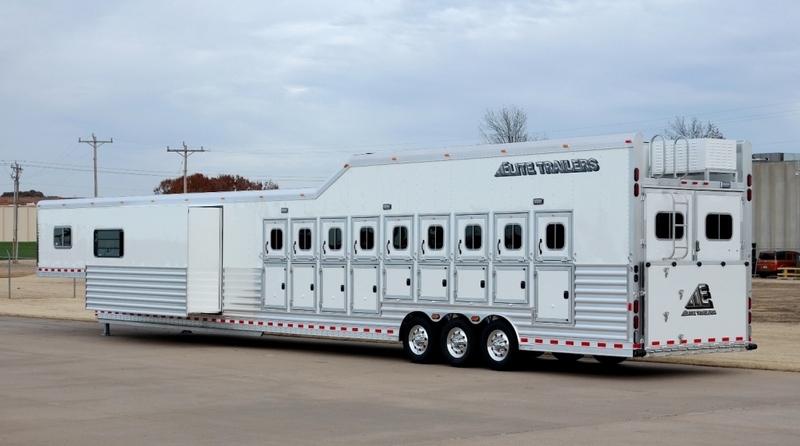 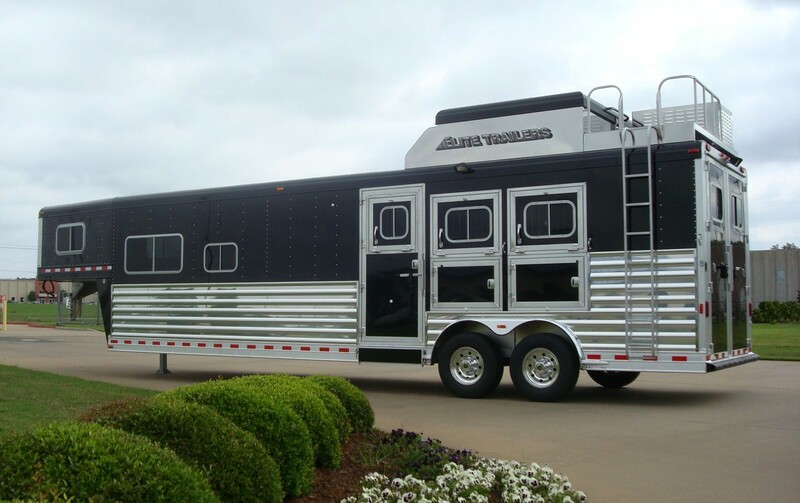 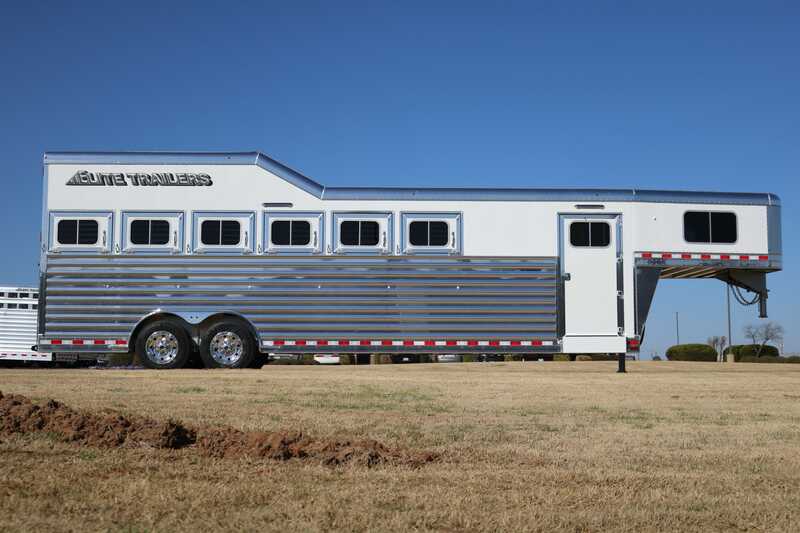 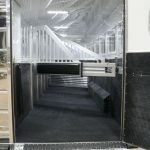 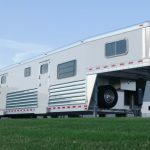 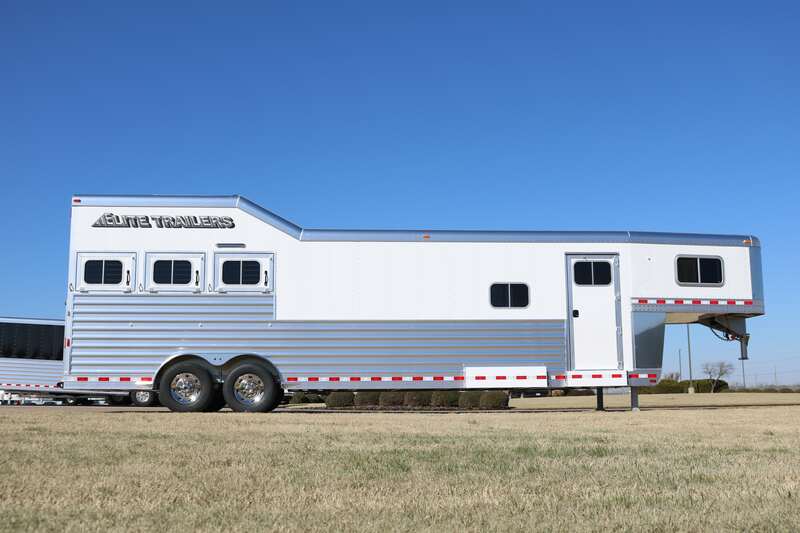 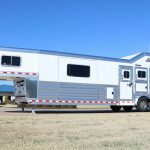 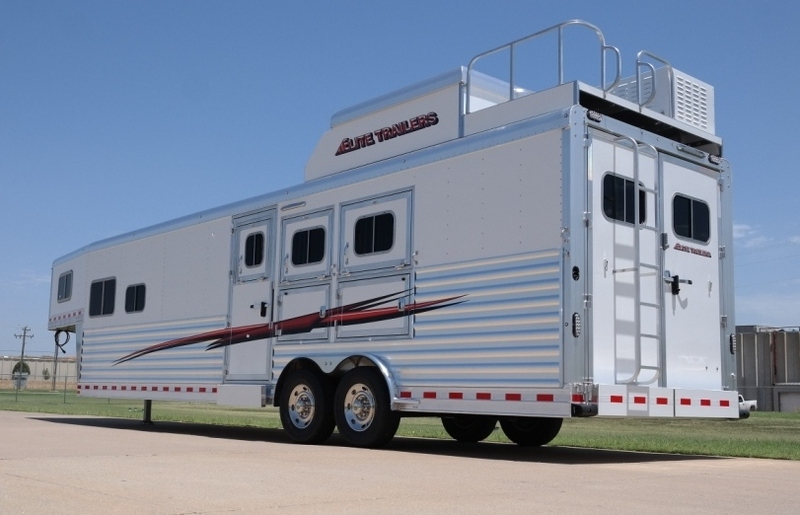 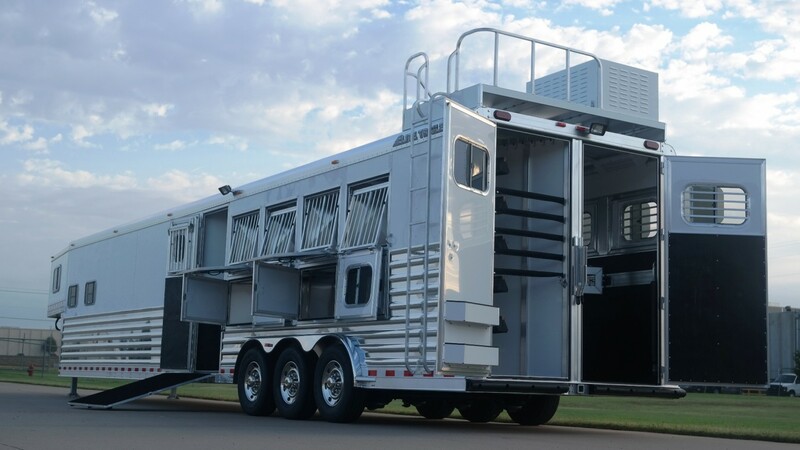 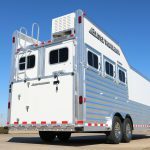 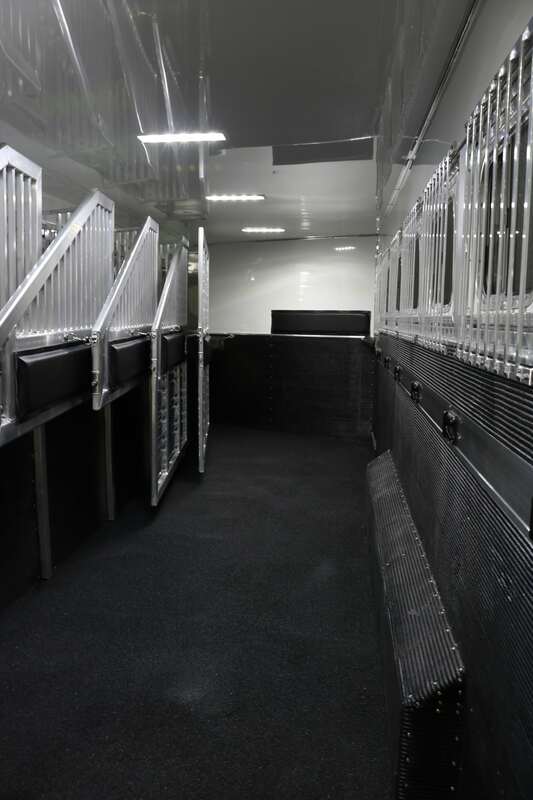 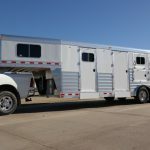 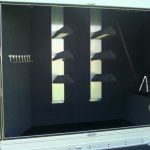 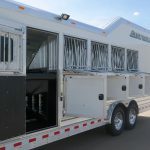 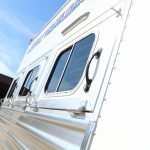 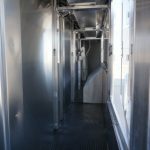 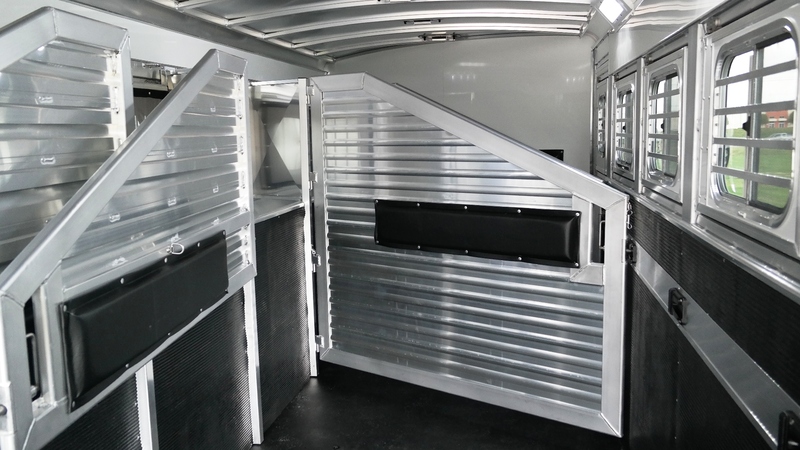 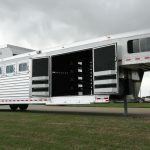 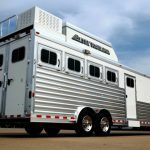 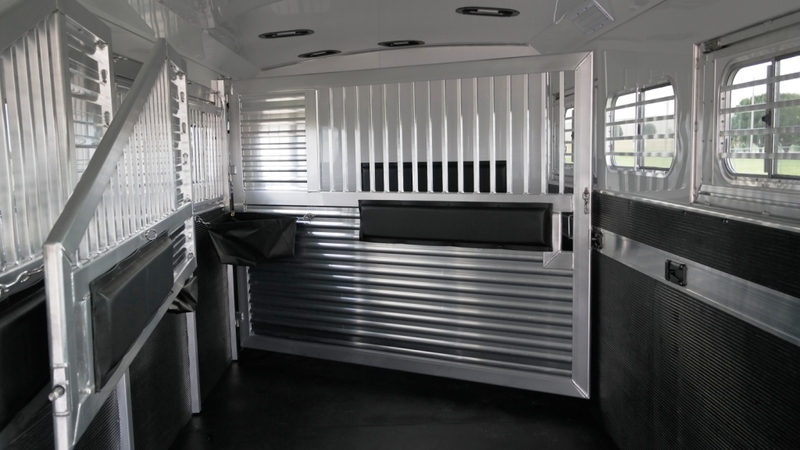 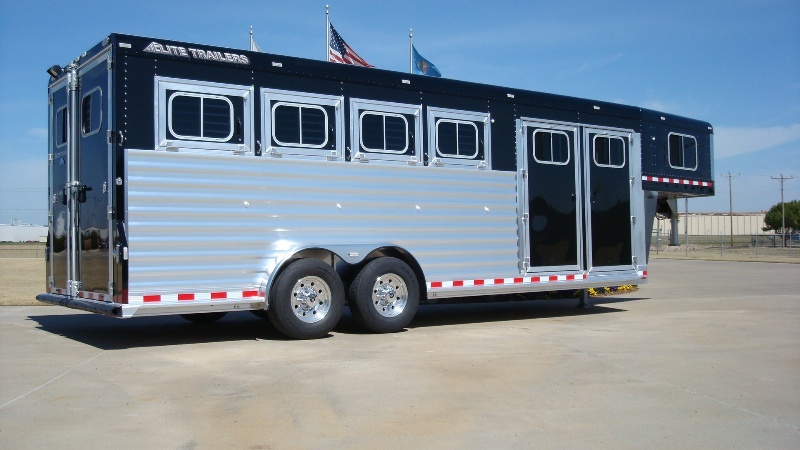 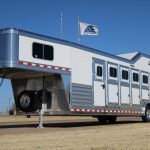 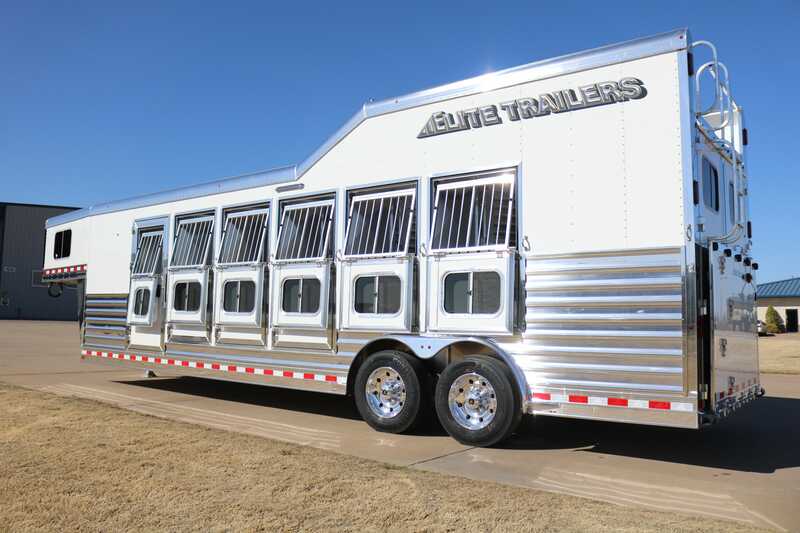 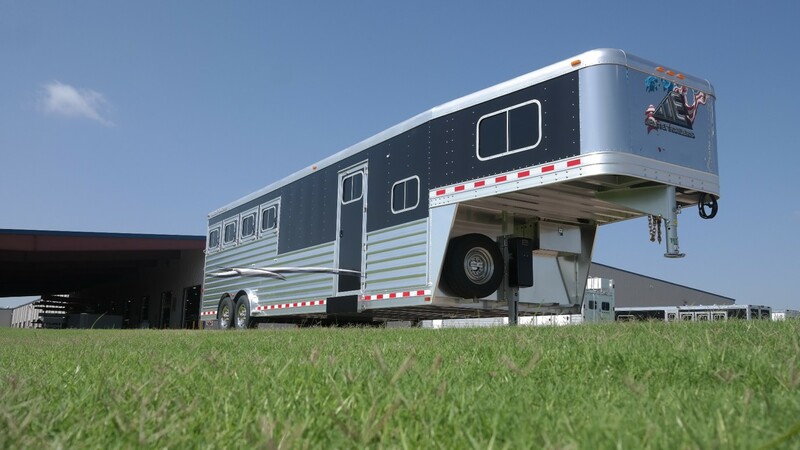 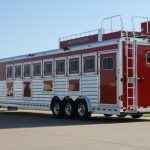 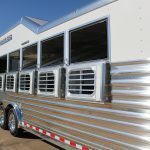 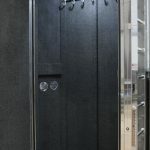 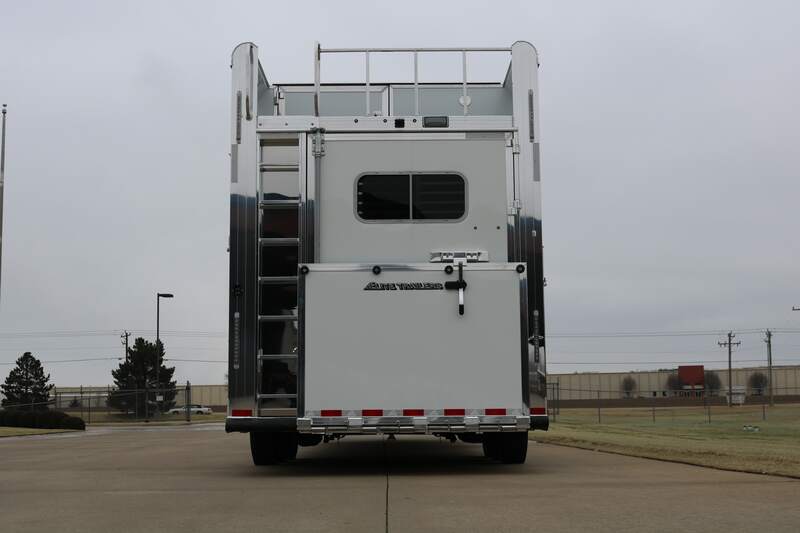 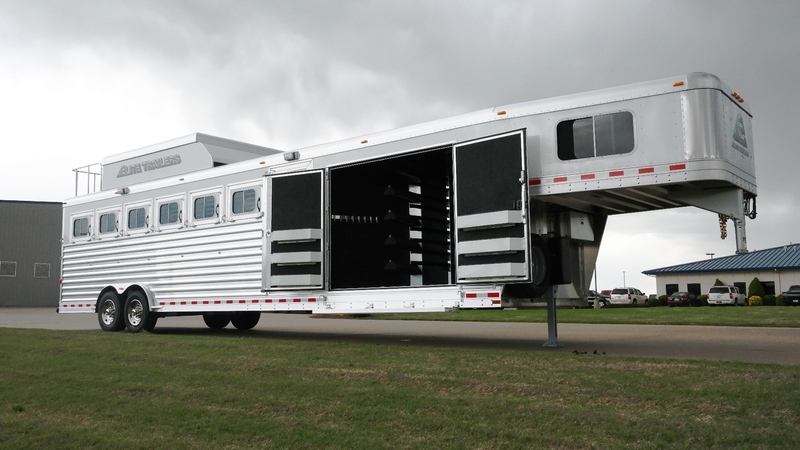 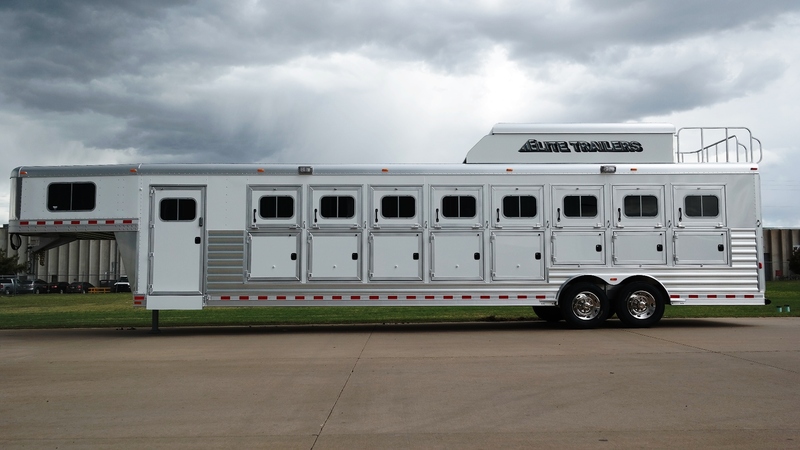 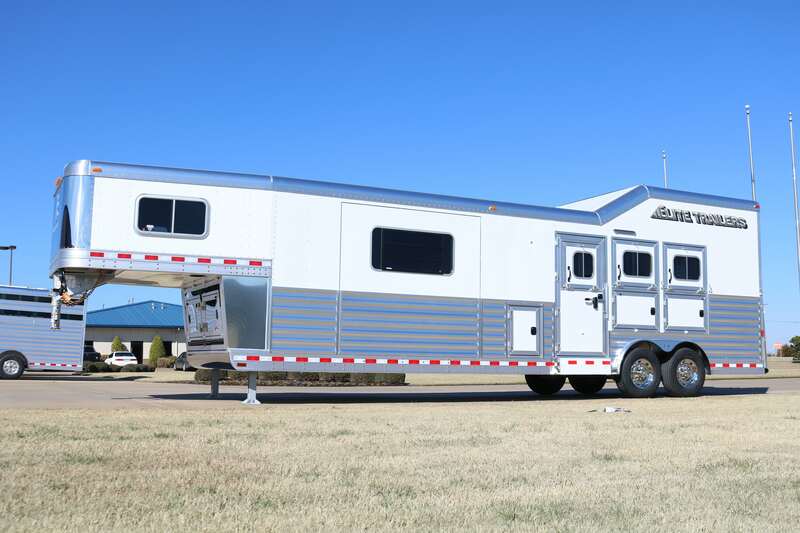 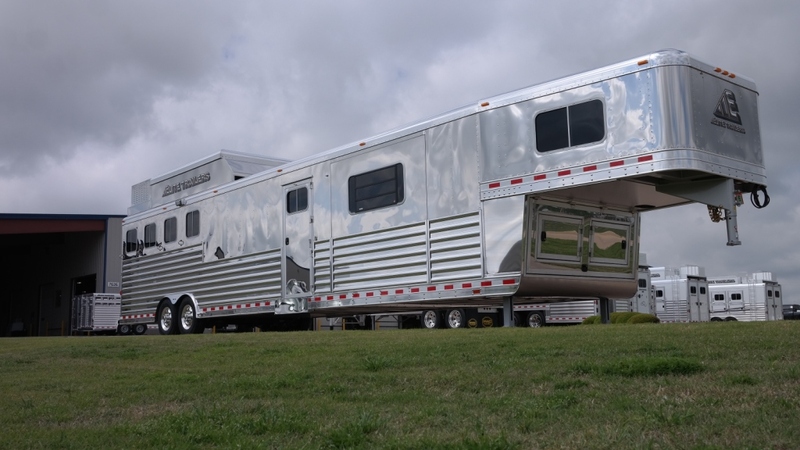 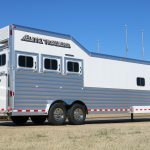 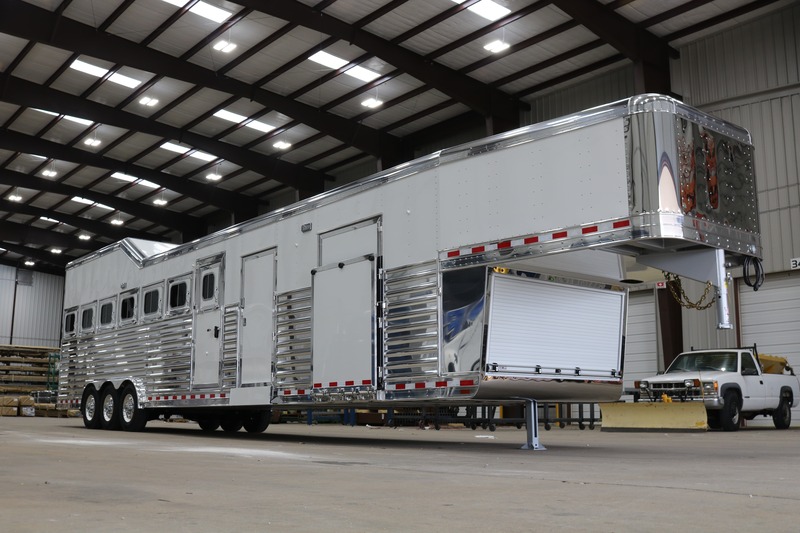 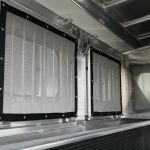 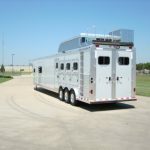 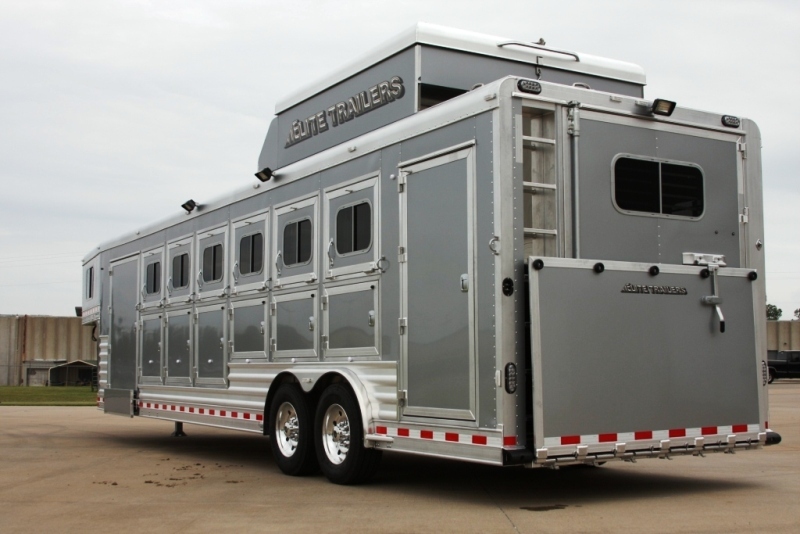 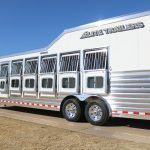 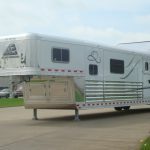 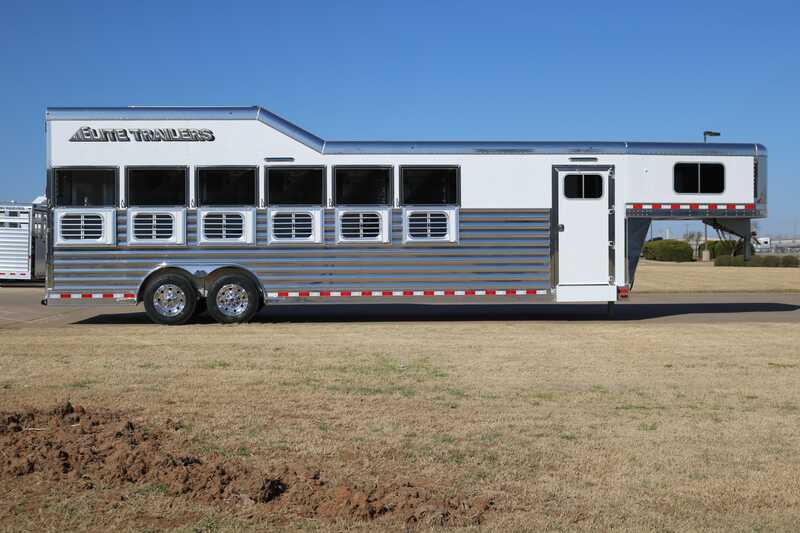 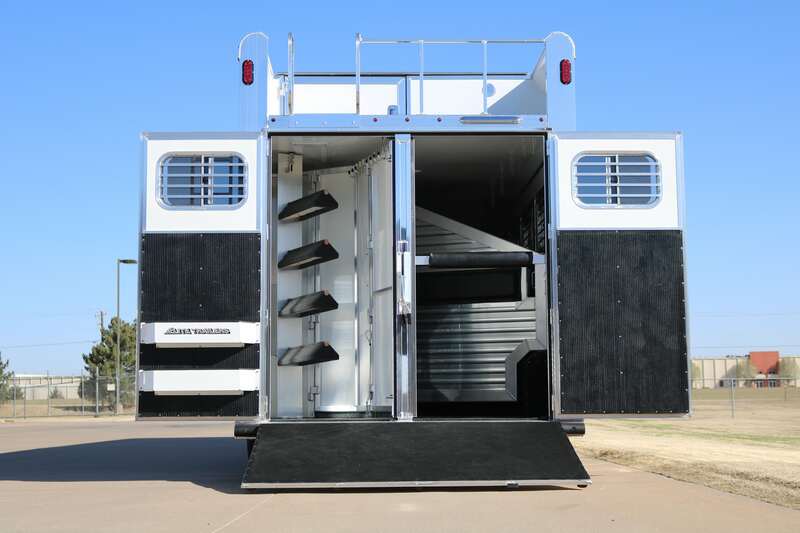 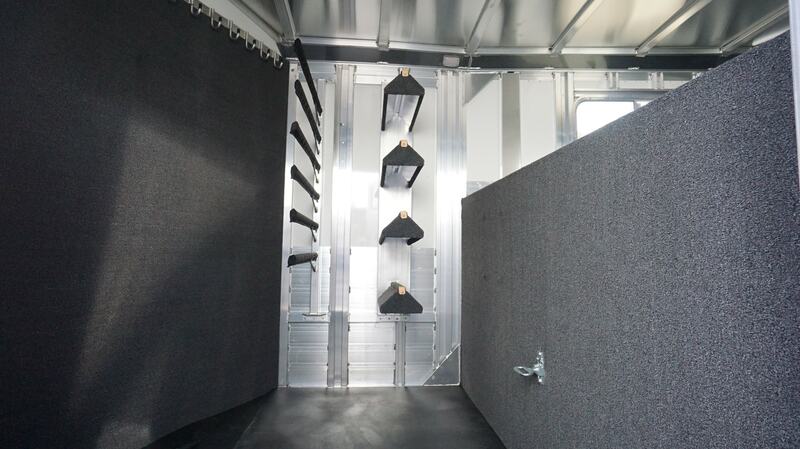 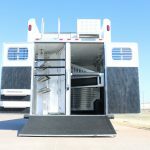 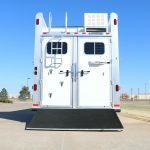 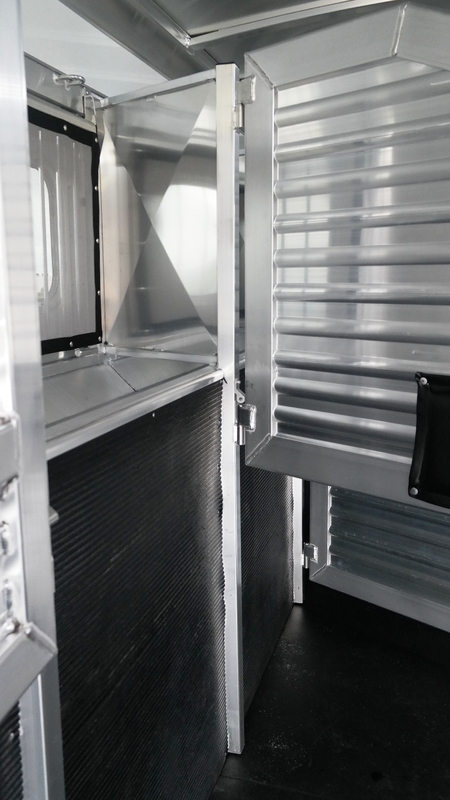 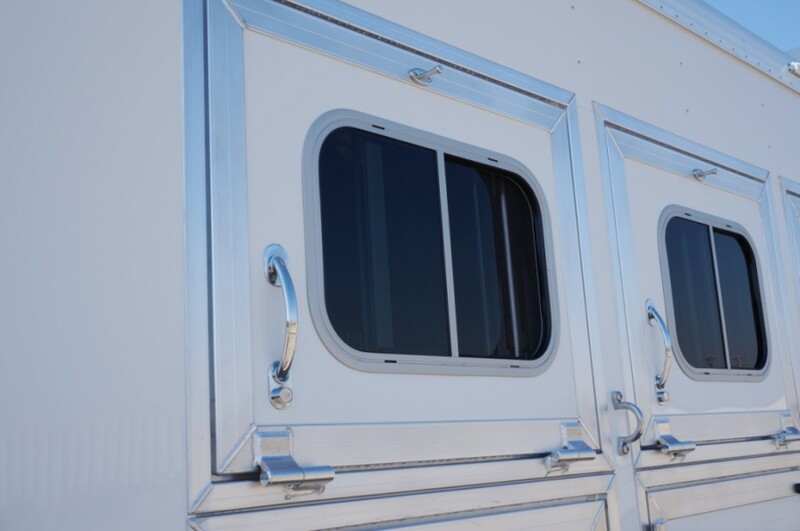 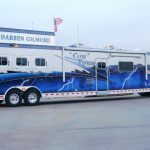 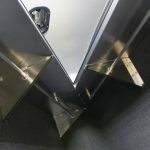 Lining and InsulationWith 4 tiers of protection, Elite Horse Trailers provide the protection from horses kicking and pawing, and help prevent sidewall damage and exterior dings. 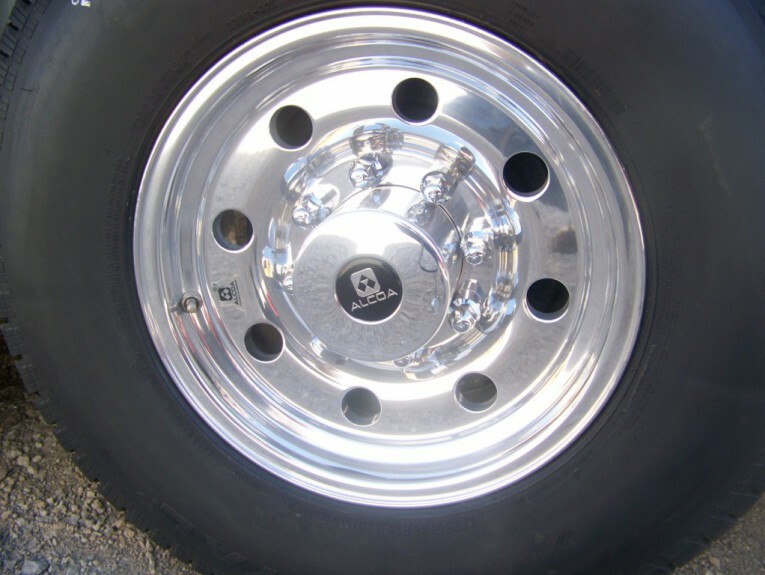 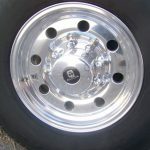 Axles and TiresElite uses Dexter Rubber Torsion axles with electric brakes and name brand tires. 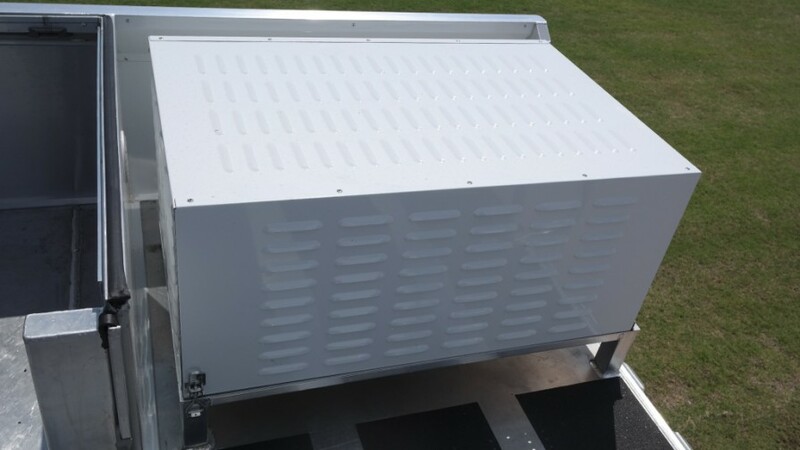 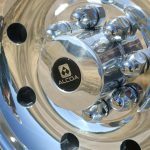 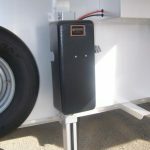 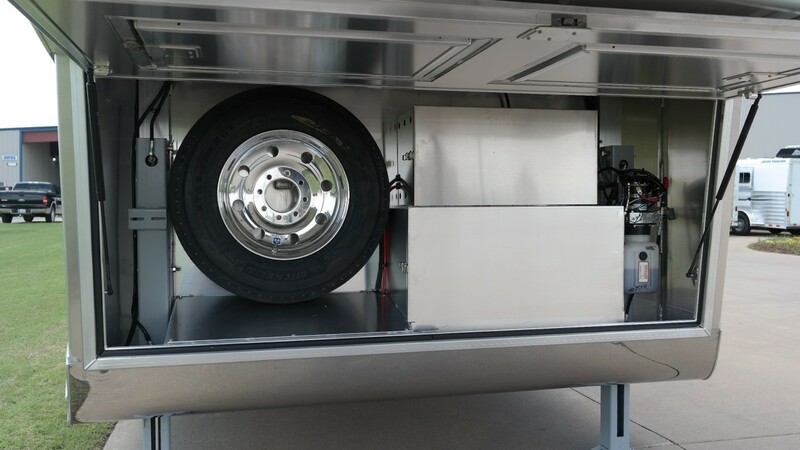 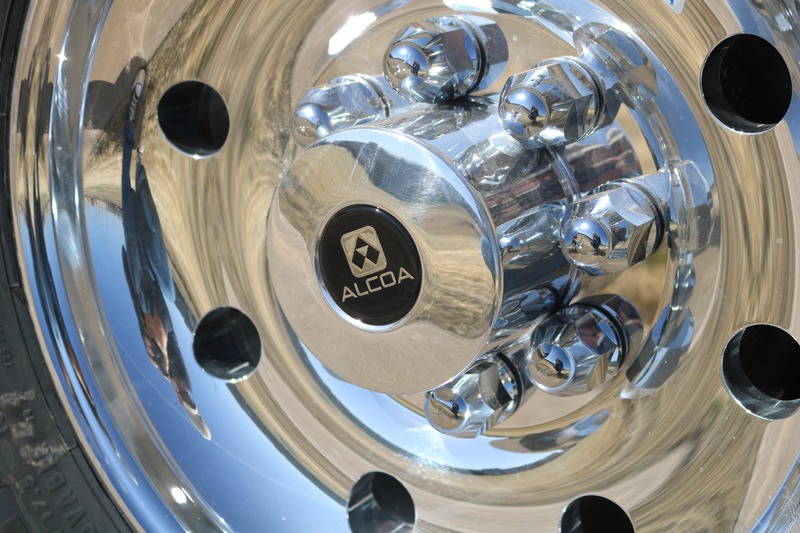 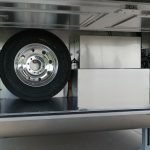 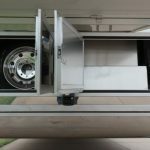 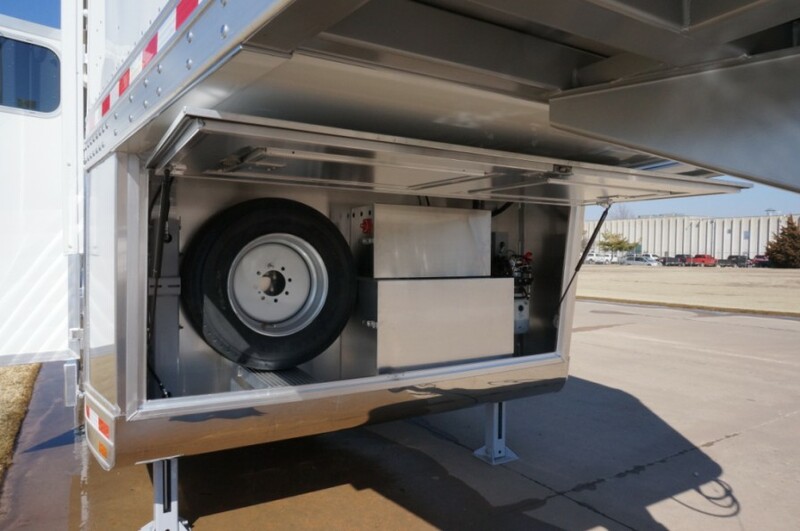 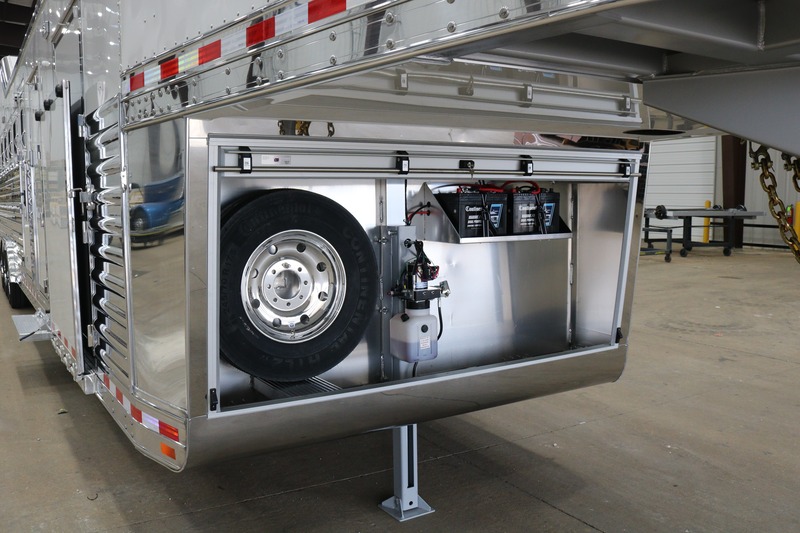 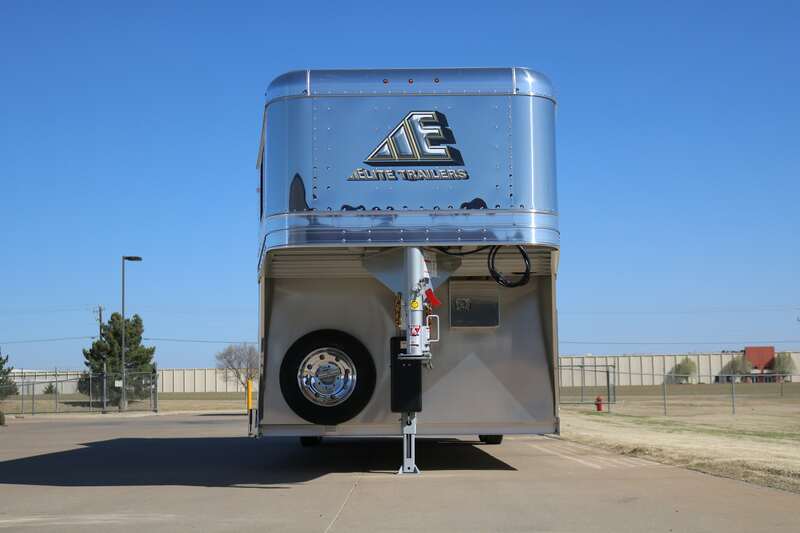 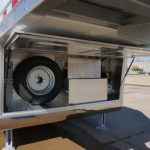 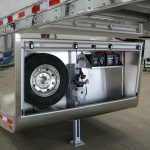 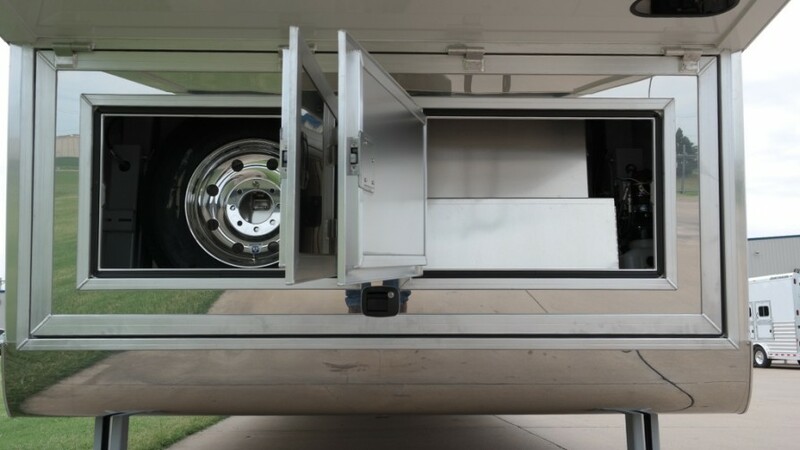 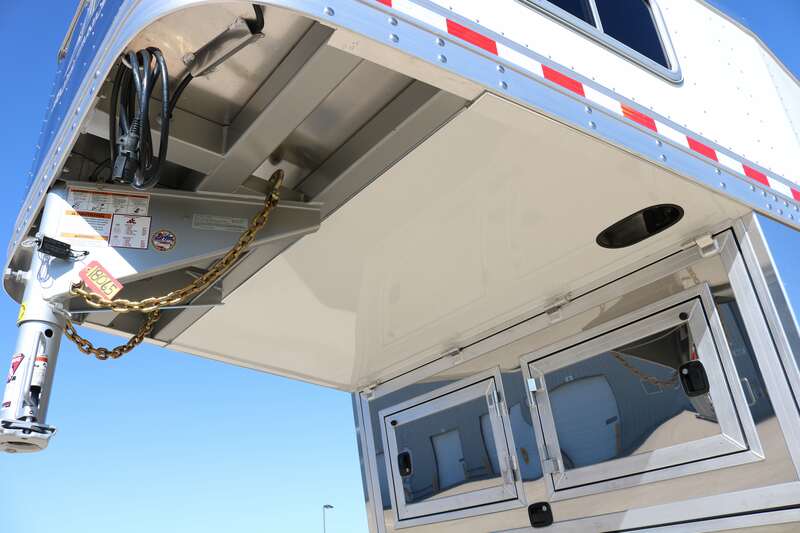 Our trailers are engineered with accurate weights that provide proper axle and tire size based on the total weight of the trailer and it's contents, including living quarters. 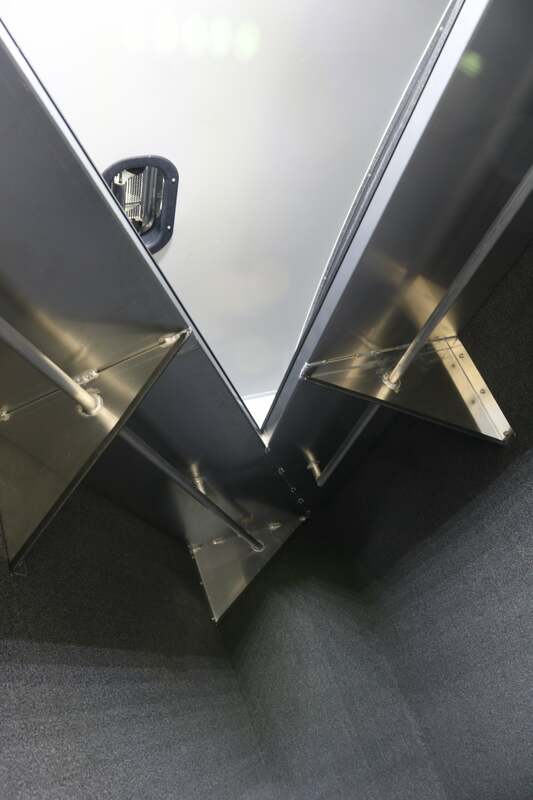 HingesElite's proprietary, heavy duty, extruded hinge is used for doors and dividers. 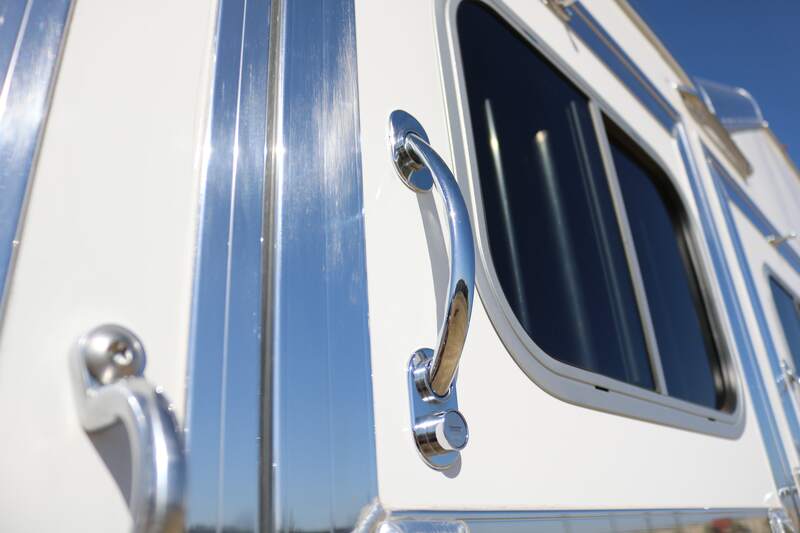 This hinge is fitted with a brass fitting that lubricates and allows for a tighter fit with the stainless pin. 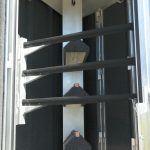 This hinge is welded to the structure to give us the strongest hinge possible. 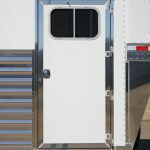 WindowsElite only uses HEHR windows. 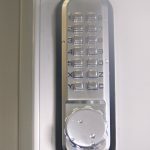 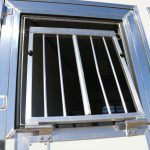 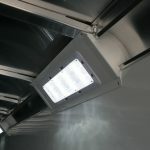 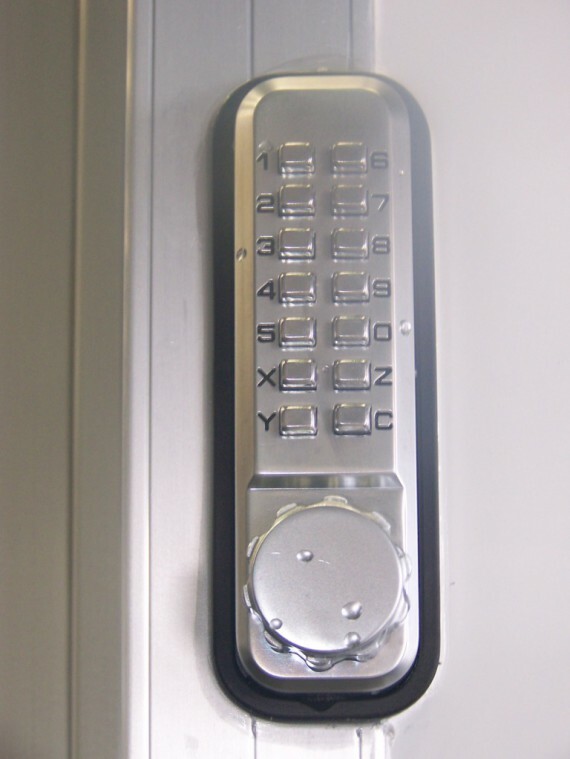 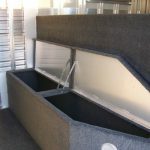 Available in many sizes and types, you can rest assured that they will be installed, worry free. 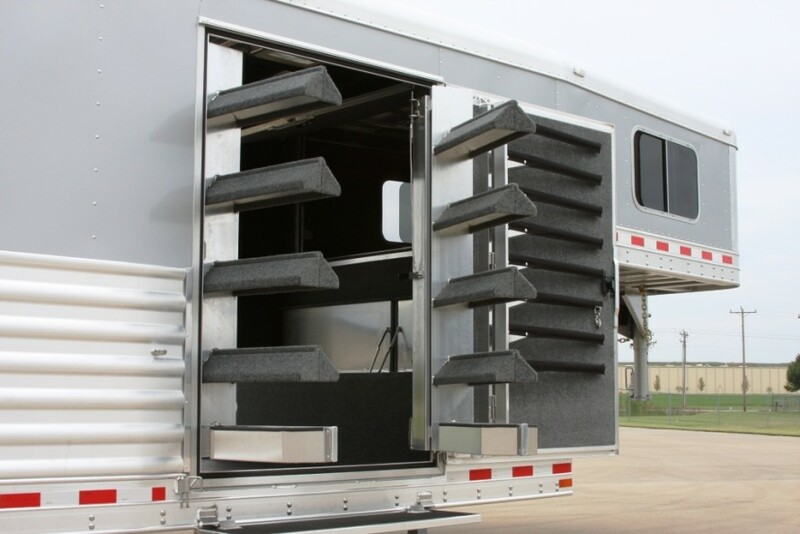 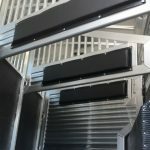 Saddle RacksThe Elite built carpeted saddle racks are designed to hold a large variety of today's saddles. 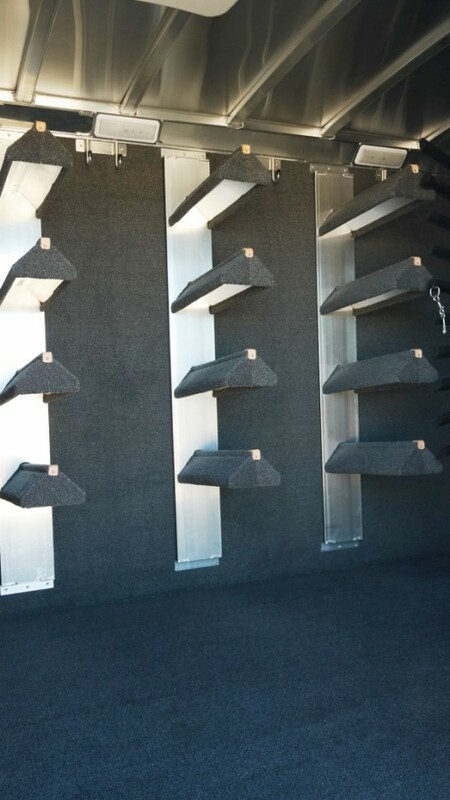 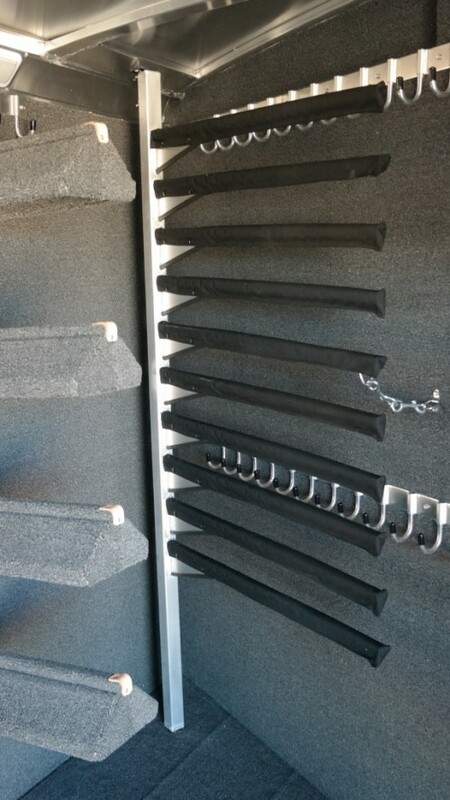 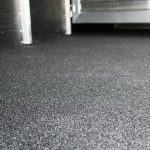 Wall RubberThe wall rubber on our trailers is corded rubber matting that is able to absorb impacts that would damage lesser made products. 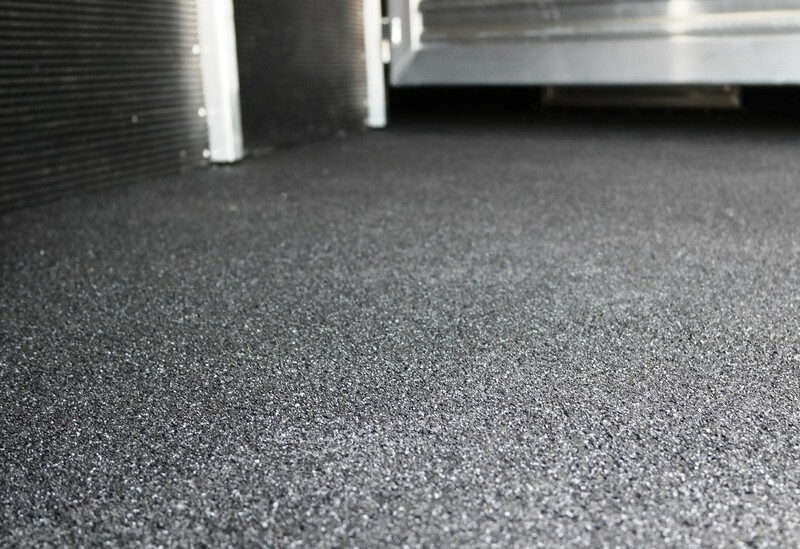 CarpetMarine grade carpeting is used in the tack room and other applications to assure a long life. 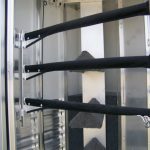 Top RailContinuous 5" radius rail with an overall height of 8" and a material thickness of 3/16" with an integrated drip rail. 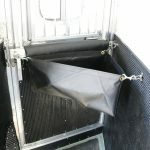 Drop Gusset3/16" thickness, welded one piece gussets which add structure to provide maximum nose strength. 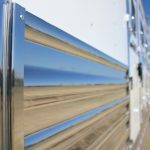 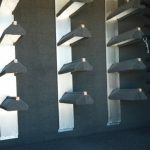 Drop Wall3/16" thickness with an engineered break on the top and bottom adds strength and allows for a cleaner weld area to ensure against leakage. 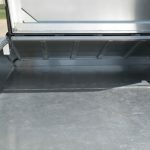 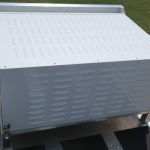 FlooringElite's floor structure consists of 4" I beams with an upper 2 1'2" flange and a lower 3" flange on 12" centers. 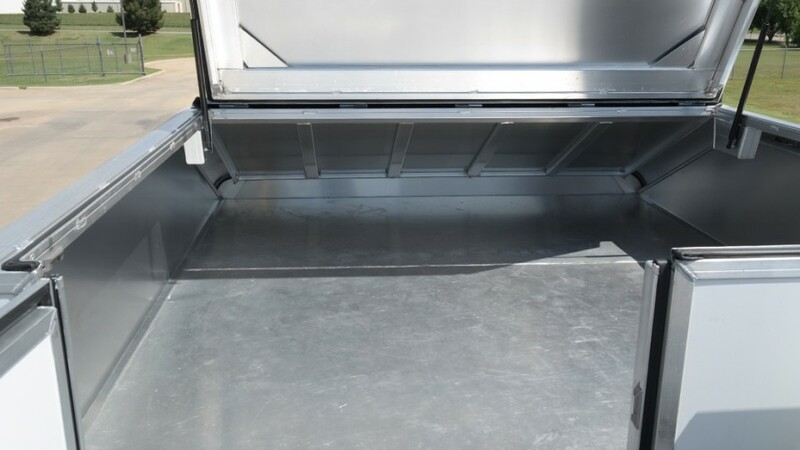 Elite utilizes a .125" thick, 5052 marine grade sheet floor on top of the structure. 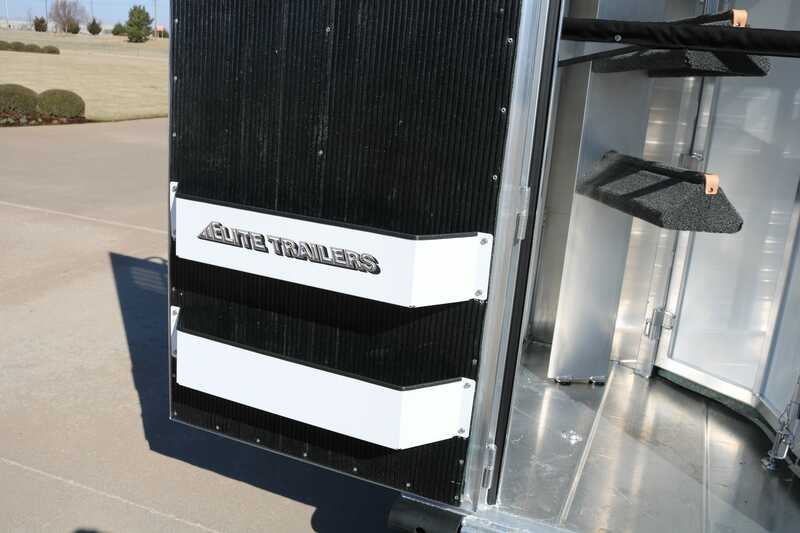 Rear FrameThe rear frame is supported by a 2 1/2" x 5" upper header at a 1/4" thickness. 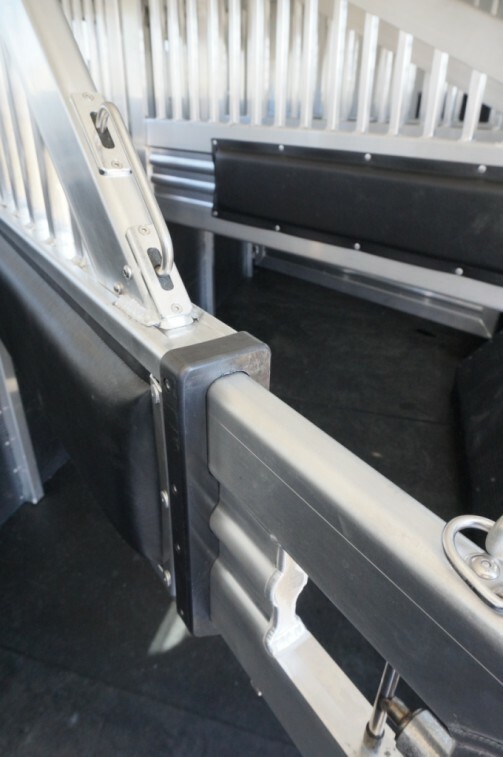 For added strength, the rear frame side post is integrated through the floor into the bottom rail. 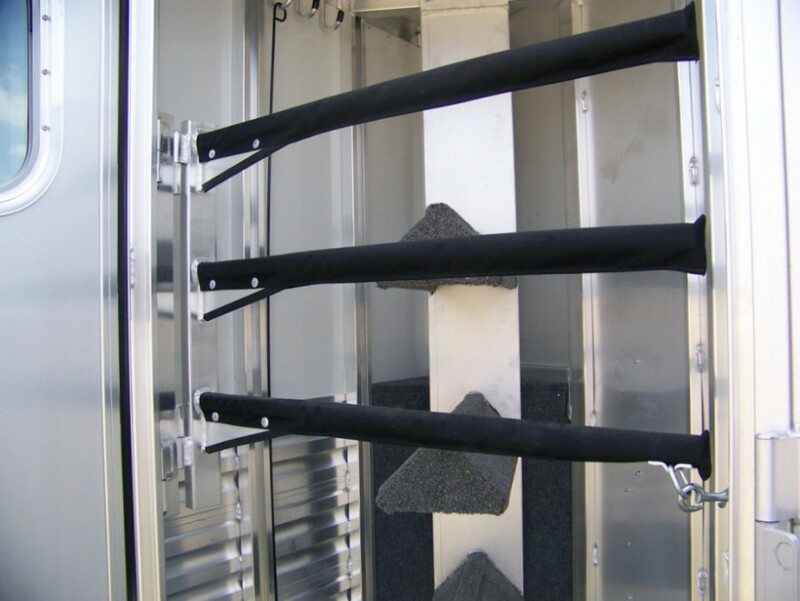 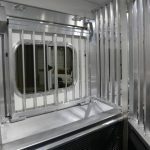 Aluminum Side Wall Construction6005 T6 aluminum alloy posts with 7" posts at the drop wall, 5" x 1 3/8" at doors and dividers, and 1 3/8" x 2 1/2" for all other side wall structure posts. 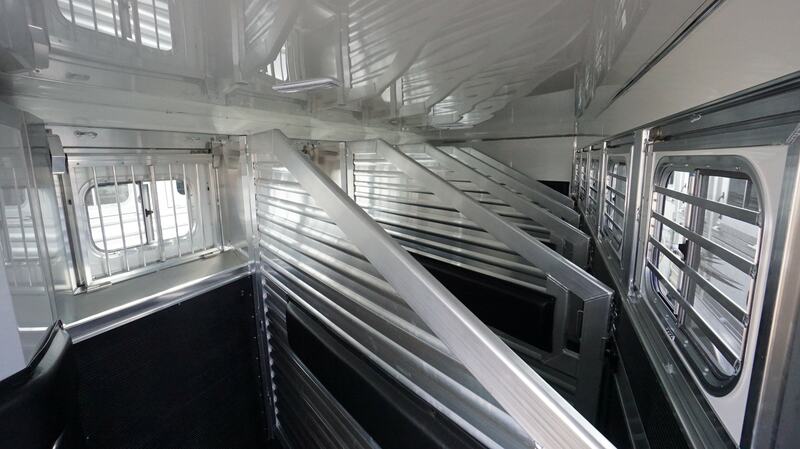 The exterior, 6063 aluminum interlocking extruded slat is .125 thick. 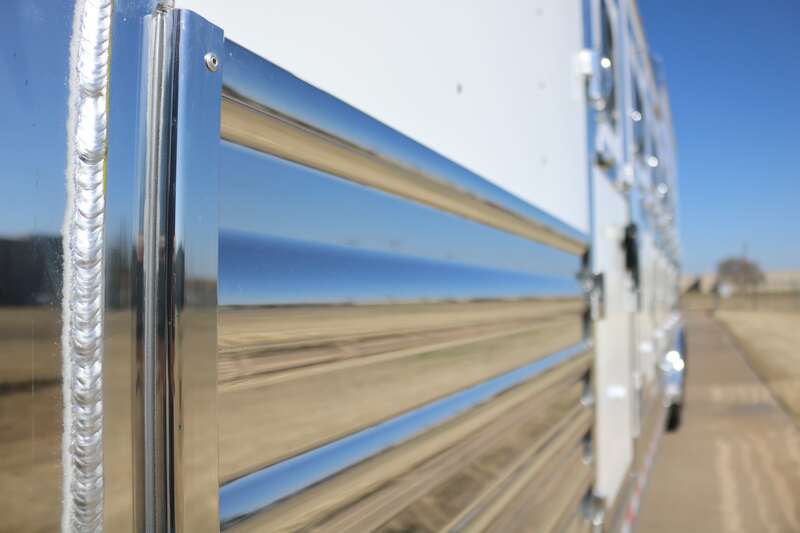 Exterior smooth sheets are a 3004 aluminum alloy with a H291 temper and thickness of up to .063". 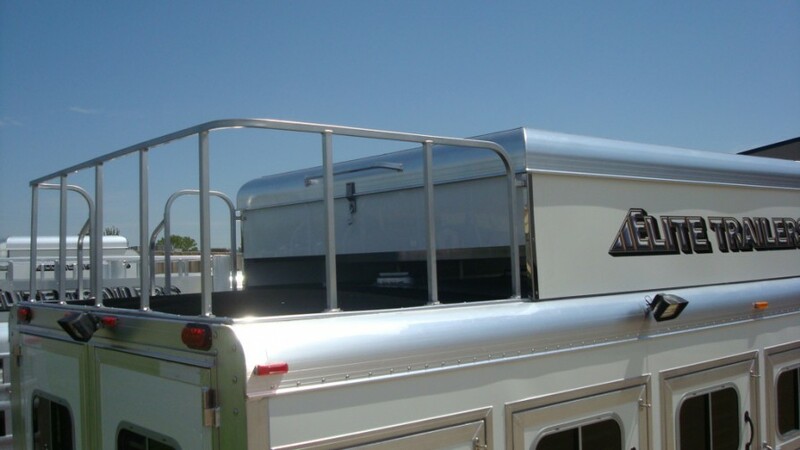 Roof Construction1" x 2 1/2" arched roof bows with one piece, .040" thick 3003 H16 aluminum roof sheet.